On the back of a record breaking broodmare sale (Readycatgo changing hands for $210,600 just last week) www.bloodstockauction.com is celebrating a great race day result with the $150,000 Listed Tasmanian Oaks victory recorded by gutsy filly Shady Hustle at Launceston last Sunday. It was win number four from just six starts for the Stephen Lockhart trained filly who also impressed winning the Tasmanian 1000 Guineas in late January. Already she has amassed in excess of $147,000 in prize money - a great effort for a filly who was sold through www.bloodstockauction.com for just $3,300! Six different people bid on the daughter of Hussonet last June, the Lockharts delighted to have secured her and happier still when she so quickly found form - third at her Hobart debut last November, easily breaking her maiden at just her second start. And it has been all up from there, Shady Hustle rising rapidly through the ranks and with her latest black type success making her a valuable future broodmare prospect. Until the 1400m the widest of the nine runners having drawn a tricky gate, Shady Hustle made an early move to sit outside the leader, taking a sit shortly afterwards when pace was put into the race. Approaching the turn she was nicely poised to chase and that she did, showing great heart off a tough run - over the final 200m engaging in a two horse war and from the 100m getting the better of Our Long Sali, drawing clear to win by 1 1/4 lengths. "She has just got better with every run," Stephen Lockhart said, his wife Andrea recalling that they liked what they saw of her when the first logged into the sales site last winter - "we liked her pedigree and there was a video of her and looked such a good, calm walker." The Lockharts had already enjoyed success with www.bloodstockauction.com and will be back for more - "it is a great site to buy from and there have been a lot of good horses sold, we will definitely source more horses from them." www.bloodstockauction.com's Anthony Gafa was delighted by Shady Hustle's stakes success and is looking forward to seeing how the promising filly - who is now enjoying a well-earned spell - progresses. "It is extremely gratifying to see clients enjoy such great success," he said, all smiles after such a great week for his auction site... " we had a stakes winner purchased for a bargain price and a broodmare prospect sell for a record price. We cover all spectrums of the market and have something for everyone." www.bloodstockauction.com hold a sale each Tuesday evening with a variety of racehorses, broodmares, yearlings, weanlings, stallions, stallion nominations and off the track prospects online for six days prior to auction - affording potential buyers the opportunity to do their research and arrange inspection if required. It was a record breaking night for popular online auction site www.bloodstockauction.com with thousands of people across the country and beyond logging in. Which resulted in the company's best ever broodmare result, the lightly raced mare Readycatgo the subject of great support with 154 bids seeing her change hands for $210,600. The four-year-old - who fetched $180,000 as a yearling - is a daughter of champion sire More Than Ready and the outstanding broodmare Faster Pussycat, a stakes placed Flying Spur mare who has been represented by seven winners from as many to race. And amongst that impressive tally are the stakes winners Gai's Choice (already dam of the Listed winner I Like It Easy), Atmospherical and Peron. Readycatgo's grandam Presina was three times successful at stakes level and she is also the second dam of the Gr.1 Oakleigh Plate winner Eagle Falls, the Gr.3 Hawkesbury Cup winner Fabrizio and the Gr.3 Maybe Mahal Stakes winner Mahara. This is a family brimming with black type with its other members including the champion sire Marscay and the Melbourne Cup hero Subzero. And there is more to come with Readycatgo's dam Faster Pussycat still at stud, last year served by the high class sprinter Supido having produced a Star Witness filly in late October. Readycatgo's new owners can be excited about the possibilities of this family with her female relations visiting such highly regarded stallions as Zoustar, Spirit Of Boom, Star Turn, Capitalist, Snitzel, Vancouver, Russian Revolution and Redoute's Choice. In the past triple figure results have been the domain of traditional auction houses but the success of www.bloodstockauction.com proves that there are great, more cost effective and more convenient ways of selling your high class bloodstock. "This a significant example of the capability of www.bloodstockauction.com as an auction provider for high value stock," said the company's Anthony Gafa, "and an example of the success and growing popularity of online thoroughbred auctions in general." Readycatgo is the second highest sale for www.bloodstockauction.com with the stallion Warhorse auctioned off for $275,000. "Readycatgo and Warhorse are the two highest prices achieved in online sales in Australasia," Gafa said, confident that the concept is only going to get more and more popular. With sales held each Tuesday evening, there are ample opportunities to secure horses of great variety; racehorses, broodmares, stallions, stallion nominations, yearlings, weanlings and off the track prospects. The sale just keeps getting stronger as this week's catalogue showed with other encouraging results including $37,400 for the lightly raced gelding Surreal Image (100 bids), $32,500 for the in work mare Scarlet Missile (24 bids), $25,500 for the well related broodmare Jayqin Star (89 bids) and $43,500 for the Frankel stayer San Remo (96 bids). The next auction will go live at 7pm AEDT this Thursday with entries for the catalogue taken up until 6pm AEDT. To enter a horse visit www.bloodstockauction.com or call 1300 849 349. Last Stance is a bay mare by ARTIE SCHILLER (USA), sire of 47 Stakes winners including BOWIES HERO, MY CONQUESTADORY, FLYING ARTIE, WE MISS ARTIE. She is out of a ZEDITAVE, mare ZIGGY BREAK who is a Half-sister to VRC MELBOURNE CUP [G1] placed ZAZZMAN. From the Group winning Family of GLENVIEW (NZ) and WRC New Zealand Oaks [G1] winner ZEPHERIN. Last Stance is believed to be in foal by AMBIDEXTER who currently stands for $7,700 at Cornerstone Stud. She has a fIlly at foot by FREE EAGLE his current service fee is $16,500 he is the Group 1 winning son of HIGH CHAPPARAL. She is great to handle. Your opportunity to purchase a great 3 in 1 package to a well-bred family. DNA kit not yet issued by Studbook. She has been unbeatable on the track for more than three years and it seems only the Longines World’s Best Racehorse committee have been able to find a way to get the better of Winx since her 29-run winning streak began. Winx has been the best-rated horse in Australia for 2015-16-17 and was rated in the top three in the world for 2016-17. She has been the best horse on turf in those two years but has never been given the top honour. That should change at the Longines World’s Best Racehorse ceremony in London on Wednesday. The latest rankings have Winx and English middle-distance star Cracksman on a rating of 130 and, if there are no adjustments, they should share the award. The award recognises the best performance of the year and has proved controversial in the past. American galloper Arrogate won the award in 2017 for his win in the Dubai World Cup before being beaten in his next three starts and retired. It should be an award for continued excellence and, in that category, Winx is unequalled. Her 29-race winning streak is the best in modern times and her seven group 1s in 2018 simply remarkable. Sea The Stars won six group 1s in 2009 when he was named the world’s best. Winx outstripped that record with wins in the Chipping Norton Stakes, George Ryder Stakes, Queen Elizabeth Stakes, Winx Stakes, Colgate Optic White Stakes, Turnbull Stakes and Cox Plate at the top level. Winx’s trainer, Chris Waller, and connections Debbie Kepitis, Peter Tighe and a representative of Richard Treweeke, will be in London for the awards on Wednesday. Winx took out the 2018 Secretariat Vox Populi award for the world’s most popular racehorse last year. Fans from more than 60 countries voted online in the annual award. “For a horse from out of America to win an award here, it’s very special and it’s not lost on us,” Kepitis said after receiving the award last week. Winx is set for a farewell campaign and she started her build-up for a return to the track with a barrier trial on Tuesday. Trainer Chris Waller admits he is looking for any sign that, as a seven-year-old, Winx is starting to lose her edge. “If anything, she looks better than we have had her at the stage before. She is fantastic,” Waller said. “She has been a little charged up . . . and if anything, that is a positive. It is just showing she is enjoying herself and not giving any signs of stress about her. “It is just like last preparation: it is one race at a time. We won’t say when the end is. We are focused on the Apollo Stakes in the middle of February at the moment. Winx is set to return in the Apollo Stakes at Randwick on February 16. The Chipping Norton Stakes, George Ryder Stakes and Queen Elizabeth Stakes are to follow. Last Stance is believed to be in foal by AMDEXTER who currently stands for $7,700 at Cornerstone Stud. Your opportunity to purchase a great 3 in 1 package to a well-bred family! AKEED MOFEED's sire DUBAWI produced WS Cox Plate close up second placegetter BENBATL, who kept up with WINX until the last 100m - finishing just 2 lengths behind her and almost 3 lengths ahead of HUMIDOR. DUBAWI, who is Britain's most expensive stallion, stands at €250,000 and ranks number 2 in the world ahead of stallions such as DEEP IMPACT, WAR FRONT & FRANKEL. Hailing from the same stallion as BENBATL and MONTEROSSO, AKEED MOFEED is still a relatively new but extremely promising and exciting stallion for you to consider. AKEED MOFEED brings with him his own impressive resume and a total earning of $3,907,561 in prizemoney. A winner over seven furlongs at two, AKEED MOFEED also finished second in the Beresford Stakes (G2, 1m) when trained by John Oxx in Ireland, where he also he won the Platinum Stakes (Listed, 1m) and finished fourth in the Irish Derby (G1, 1m4f), which was won by Camelot (Montjeu), at three, before he was sold to Hong Kong. He is the sire of winners including ASSERTIVE PLAY, SUNSET WATCH, HEART CONQUERED, POISED TO STRIKE. Bloodstockauction.com proudly presents 4 outstanding lots by AKEED MOFEED - UNRESERVED courtesy of Goldin Farms. Here is your opportunity to buy into bloodlines that are very rare and extremely hard to obtain! A tough, consistent 4YO gelding sired by the record breaking Snitzel. This horse would be the perfect addition to anyone’s stable who predominantly race in the country/provincial circuit. Being trained in the metropolitan area, the owners are happy to move the horse on as we feel he will not make metropolitan grade. Having only had 8 runs to date, this horse has plenty of racing left in him & he was a $60,000 purchase at the Inglis Easter Yearling Sale. He was an immature yearling so we were patient with him and has grown into a very nice individual. Very good to handle & easy to ride. Aggarwal is a 4yo Chestnut gelding by SNITZEL, sire of 83 Stakes winners including Dual Everest winner REDZEL, TRAPEZE ARTIST, SIZZLING, HOT SNITZEL, SHAMUSAWARD. He is out of a FLYING SPUR mare who is a half-sister to Listed winner EXPRESS POWER. From the Family of LADY’S DELIGHT(SAF). Rezyana, Sunday Service. Aggarwal is lightly raced having placed on 4 occasions out of 7 starts and last ran at Gosford 4th October. Archery Peak reaches his peak! This 5yo bay gelding by ARCH, sire of 65 stakes winners including BLAME, OVERARCHING, ARRAVALE, LES ARCS, PINE ISLAND, GRAND ARCH achieved a great result this past auction. Archery Peak sold for more than 10x his reserve price for Cumani Racing, AUS. Archery Peak wasn't the only one who sold for more than expected, with UNRESERVED broodmare Hot Streak also selling for over $25,000. With up to 80% clearance rates, you could be our next success story! Bloodstockauction.com are running a promotion this week offered exclusively to our members! Pay for a bronze listing and receive all the benefits of a silver, or pay for a silver and receive the benefits of a gold! If you’ve always wanted to see what that next level listing could do for you now is a great opportunity. Includes listing in our online catalogue. Unlimited photos, videos and description. We can do the listing for you. Listed in a large banner at the top of the homepage for maximum exposure. You also could be chosen for our catalogue highlight mailout to all our members and database. Listed on the homepage for better exposure. If you have any horses to sell or know of any for sale please call our expert sales team on 1300 849 349 to chat about how we can help. Valid for our next auction going live tomorrow night 7pm AEDT. Leonarda is a well -bred lightly raced 3yo filly by CASINO PRINCE, sire of 15 stakes winners including ALL TOO HARD, ESCADO, HOOKED,STAR ROLLING, LONGPORT. She is out of a 4-time winning CLANG mare La Bella Luisa, a stakes placed mare who has a lovely colt by International first season sire AIR FORCE BLUE currently standing at Coolmore. A beautifully put together filly, Leonarda is a half-sister to Lucky Louie, who is stakes placed, and was narrowly beaten in the GIMCRACK Stakes, and the OTTAWA Group 3 on Melbourne Cup day. Only selling as moving overseas. Bloodstockauction.com is excited to now offer members and syndicators the opportunity to advertise and sell their shares as part of our weekly online auction. We have always believed that our online auction platform was a great way for members and syndicators to promote and sell their shares, so we have created an exclusive ‘Shares’ section within our weekly catalogue. With 11,000 active members, and a further 15,000 followers on social media, listing your shares on Bloodstockauction.com provides you with high levels of exposure across the entire racing and thoroughbred industry. In order to list and sell your shares in our weekly auction, all you need is a copy of the Syndicate Agreement or PDS, and a current AFSL. Thank you to Blueblood Thoroughbreds who have already jumped on board, listing four shares in our last auction! Should you require any further information or would like to get started, please contact Jacquie on 1300 849 349. My Biddy is a 4yo mare by WORDSMITH, sire of stakes winners including GEEGEES GOLDENGIRL, GEE GEES TOP NOTCH, GEE GEE DOUBLE DEE, GEEGEES CLASSICBOY. She is out of a 3-time winning TELESTO(USA), mare. An outstanding mare that is lightly raced a very good beginner always jumps in front, can sit or lead of pace. A short course specialist and likely to run very well and continue her good form. This mare has had 3 wins and 4 placings from 8 starts with over $40,000 in prizemoney having last raced on the 23rd September. My Biddy has speed to burn and much residual value as a broodmare prospect later in her career. MORE THAN READY mare with extremely difficult bloodlines to obtain! LADY MARVEL is by MORE THAN READY out of MARY MARVEL, from the family of SUNDAY JOY, TUESDAY JOY and MORE JOYOUS! Lady Marvel is a beautifully bred filly by Champion Sire MORE THAN READY out of a mare by Champion US Stallion FUSAICHI PEGASUS. Serious black type family! BRED IN THE PURPLE. Lady Marvel is a lightly raced, flashy chestnut filly with no vices and a huge future ahead of her both on the track and in the breeding barn. Lady Marvel sold at the Magic Millions as a yearling for $260,000. She is still maturing and will clearly benefit with some more time - average sized, average weight. Here is your opportunity to buy into an Australian Blueblood Family! Don't miss our final countdown TONIGHT 7pm AEST! “Sapience” was purchased back in January this year for the bargain price of $3500 . The 6yo gelding by TROTAMONDO (CHI) out of a SPECIAL BOND mare has since gone on to win over $26,000. His most recent run at Dubbo on the 27th of August was one of his best, adding an 1120m win to his resume and earning $11,085. Final countdown TONIGHT at 7pm AEST. Broodmares are still proving popular amongst buyers despite the drought, with 70% of broodmares clearing our last auction. Lot #53 - Katie Bell, Lot #55 - Layo Layo, Lot #62 - So Electric & Lot #66 - Zablitz all sold for over $20,000 - with Zablitz being our highest selling broodmare at $26,500. Our next Bloodstockauction.com Catalogue goes live tonight, Thursday 6th September, 2018 at 7pm (AEST)! You won’t want to miss this catalogue which will feature racing and breeding prospects from leading Australian and New Zealand Thoroughbred trainers. Bidding for our next auction closes on Tuesday, 11th September, 2018! Brazilliant a Bloodstockauction.com graduate was purchased at our 7th March 2017 Auction for just $900, and has turned out to be a very smart investment for his new connections. Over the weekend, on Saturday the 5th of May, Brazilliant who was being ridden by Jockey Jason Lyon led the field and won at Alice Springs Turf Club earning $11,835 in prizemoney! Brazilliant has now earned a total of $15,035 in prizemoney since being sold from 1-win and a 2nd-place. More Wins for Mystic Moon! Mystic Moon was purchased at our 3 Jan 2017 auction for $13,250. Since being purchased at our online auction the 5yo race-mare has notched up an impressive $34,080 in prize-money. The mare has now earned well over double her purchase price. She has had two thrilling wins and a 2nd place, with her most notable win at Tamworth Jockey Club earning $19,855 in prizemoney on the 29th April 2018. Our next Bloodstockauction.com Catalogue goes live tonight, Thursday, 3rd May 2018 at 7pm (AEST)! You won’t want to miss this catalogue which will feature racing and breeding prospects from leading Australian and New Zealand Thoroughbred trainers. Bidding for our next auction closes on Tuesday, 8th May 2018! Maxwell a 3yo Gelding by Smart Missile has turned out to be a shrewd investment for his new connections. He was purchased from our 3rd March 2017 auction for just $9,350. His most impressive win to date was at Dalby Jockey Club QLD on 28th April 2018, earning $9,100 in prize-money! He has amassed a total of $22,290 in prizemoney from 3 placings and 2 wins. We have a bumper 50 LOT Auction starting tonight at 7pm (AEST)! Featuring Racehorses, Unraced, Weanlings, Yearlings, Broodmares and Stallions. Meanwhile entries for our next Catalogue close Thursday, 3rd May at 6pm! We’re calling for entries for our next AUS & NZ Catalogue. Entries close Tonight, 26th April at 6pm! Not Tonight Dear was purchased at our November 2016 Auction and since being purchased she has gone onto earn a total of $16,750 in prizemoney for her new connections. Her most exciting to date win was on Friday the 13th of April at Beaudesert Race Club earning $9,750! God Forbid also had an excellent result over the weekend, the 4YO gelding sired by Group 1 winner FLORAL PEGASUS, delivered one of his best wins to date at Alice Springs Turf Club earning $11,835 in prizemoney. His total takings since being purchased by his new connections are $41,385. Ghost Rider was purchased at our auction for a mere $2000 in Feb 2017. Over the weekend he added to his winning streak with a win at Goulburn Race Club on 14th April earning $5,250 in prizemoney bringing his total prizemoney since being purchased to $24,015. Shake Her Bon Bon was purchased on 3rd Jan 2017 for $6600 and had an superb win at Coffs Harbour Racing Club earning $5,250 for his new owners. Bringing her total takings to $28,350. Finally, our fifth winner was Congelator who was purchased for a mere $2200 at our 20 Jan 2015 auction. He had a thrilling win at Towoomba earning $10,400 in prizemoney. Congelator has had 5 wins and several placings bringing his total takings to $73,300! Find your next racing prospect: www.bloodstockauction.com or call our friendly team on AU 1300 849 349 or NZ 07 823 4117! Four Bloodstockauction Graduates Win Over The Weekend! Twelfth Raj was purchased at our August 2016 Auction. On the 7th of April he had his most impressive win at Taree earning his $11,085 in prizemoney. His total prize money since being sold is $18,240 from two wins and several placings. Bakslap a chestnut gelding was purchased at our 19th December 2017. He has had two commanding wins one at Murray Bridge on 25th January 2018 earning $10,000 in prizemoney and a win on the 8th April 2017 at Port Augusta earning his new owners $8,000. That’s a total of $18,000 in prizemoney in just a few months! Meanwhile Hegemon has turned out to be a great investment for his new connections. He was purchased at our 16th September 2016 for just $440. Over the weekend on the 6th of April, Hegemon being ridden by Jamie Mott won the Peter & Lavella DaRose - AFC Maiden & Class 1 Plate at Cranbourne earning $14,850 in prizemoney, bringing his total takings since being sold to $40,670! Finally, our fourth April winner was Ace Stryker (2013 Stryker x Supreme Ace) who was purchased at our 20 Jan 2015 Auction. Ace Stryker had an impressive win on 6th April 2018 at the Sunshine Coast earning $9,750, taking his total prizemoney since being purchased to $19,750 for his new connections. The booming partnership between Bjorn Baker and Greg Ryan went to a new level on Sunday as the pair combined to take out the $150,000 Wellington Boot with Miss Invincible. The pair have enjoyed a huge amount of success together, particularly on the country circuit in recent times. Ryan flew down the straight to claim his fourth victory in the famed 2 y.o. feature. While the race featured horses from the glamour stables of Gai Waterhouse and the Snowden Racing Team, it was Allan Denham’s Lilith which jumped a $3 favourite. Miss Invincible’s dam Abound was purchased from Bloodstockauction.com at our 15th November 2016 Auction for just $440 inc GST. We’re very proud of our Sept 2017 Bloodstockauction.com graduates! Wicked Investment (pictured above) a 5yo gelding was purchased for just $2750 at our Sept 2017 Auction. He has since gone onto have his most significant win to date at Boulia Turf Club, on 31st March 2018 winning $8,700 in prizemoney for his new owners. Wicked Investment has also placed at several other starts winning total prize money of $12,900 since being purchased. Money Ad 6yo mare by AD VALOREM was also purchased at our September 2017 Auction for just $3500. Money Ad has turned out to be a real money maker earning $21,500 in prizemoney for her new owners. Money Ad has been on a winning streak, with three significant wins at Miles winning $5,200 on 10 Feb 2018, at Roma on 24th Feb 2018 winning $4,550 and at Augathella Race Club winning $5850 in prizemoney on 2nd April 2018. She has placed 2nd three times at Cunnamulla, Charleville and Clermont, as well as one 3rd place at Charleville. February’s Bloodstockauction.com Grad’s Deliver Lucrative Returns in Just One Month! Kookiecutter, a gelding sired by Sharkbite, was purchased for just $1200 on 20th Feb 2018 and has already rewarded his new connections with a $10,400 Win at the Gold Coast Turf Club on the 31st March 2018. Returning almost 9 x times his purchase price to his new owners in less than a month. Alakai a 5yo mare by KAPHERO, was purchased at our 27th Feb 2018 auction for $4500 and has gone onto win twice since being sold. Her first win at Warwick on 9th March 2018 earned her $5250 and her second win at Gladstone earned her new owners $4,550. Kookiecutter and Alakai have proven to be very lucrative racehorses for their new connections in under one month! Imposing Moorookyle Park based stallion Sharkbite has been put on the market and has found a new home. The sale of Sharkbite offered a rare opportunity to secure a successful sire that is getting a steady stream of winners on the track. The latest winner was the Matt Laurie trained three-year-old Rock ‘em Sock’em at Echuca on Sunday. 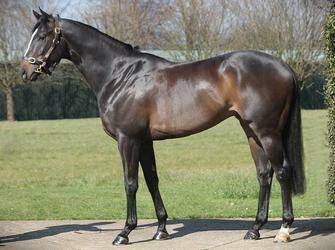 The stunning, near black, stakes-winning stallion was offered online through Bloodstockauction.com selling for $12,100. Presented for sale to dissolve a partnership, he became a farm favourite of Moorookyle Park’s Nioka Wozny since moving there from Sun Stud two years ago. “I have handled him on my own for both seasons. He has been textbook to cover, with good fertility and a wonderful attitude. I have built a great relationship with him, and when you work so hard with them in the rain, hail or shine, you build up trust in each other,” Wozny said. “Sharkbite’s progeny just take that little bit of time but, once in form, they are tough, honest performers rewarding their owners with consistent results. Being such an outstanding type, Sharkbite sold for $900,000 as an Inglis Easter Sale yearling, and went on to show his class on the track winning five races and over $290,000 in prize money. He won over distances between 1000 metres and 1700 metres with his major success coming in the Listed Lord Stakes. At stud, Sharkbite has sired 74 winners from 148 starters with progeny earnings in excess of $4.2 million. Sharkbite’s progeny have been in fine form of late highlighted by the city winning Jester Halo who a gallant last start third in the Group 3 Matron Stakes at Flemington. He is a full brother to Arrowfield Stud’s dual Group 3 winning shuttle sire Scissor Kick, being out of the blue blooded Quest For Fame mare Back Pass. Outta Space is a 4yo gelding by MUTAWAAJID who was purchased at our 21st November 2017 for just $2,500. Since being sold he has earned $20,785 in prizemoney for his new connections. Repaying his purchase price by over eight times. His most significant win to date was at Tamworth on the 26th March 2018 winning $11,085 in prizemoney. Outta Space has also had also placed 2nd on three occasions at Gilgandra on 10th February 2018, Moree on 17th February 2018 and at Coonamble on 12 March 2018. Find your next racing success at our next combined Australia & New Zealand Final Auction Countdown which starts at 7pm (AEDT) - TONIGHT! Entries for our weekly auctions close every Thursday at 6pm (AEDT). Contact our expert team via contact@bloodstockauction.com or Call AUS 1300 849 349 or Call NZ 07 823 4117 who’ll be happy to help you with any questions or assist you with your listing. Thin Disguise was purchased at our 5th April 2016 Bloodstockauction.com for just $3,000! Since being purchased at Auction, this stunning 5 yo bay gelding who was sired by Magic Albert and out of Not So Subtle mare, has gone onto win a total of $34,150 in prizemoney for his new owners. Thin Disguise has had a string of significant wins in Gatton in June 2016 winning $6,500, 3 wins at Toowoomba during January and February 2017 and one win at Roma during December 2017. He has also placed 2nd on multiple occasions, 3 times at Toowoomba, once at Thangool and one at Alpha. With several other 3rd places at Toowoomba, Gladstone, Miles and Roma! Find your next racing success at our next Final Auction Countdown for Australian and New Zealand Thoroughbreds starts Tonight at 7pm (AEDT)! Or, if you’re looking to enter your thoroughbred in our next auction, contact our team on contact@bloodstockaution.com or call 1300 849 349. Racing Success: Master Agar’s impressive Provincial Grade Win! Another racing success story for one of our bloodstockauction.com graduate! Master Agar had his most significant win to date at Kembla Grange, 6th March 2018 winning $16,630 at provincial grade for his new owners. This impressive 6yo gelding who was sired by Not a Single Doubt, also ran 3rd at Kembla Grange on 31ST January 2018 winning $2,920. Since being purchased from bloodstockauction.com Master Agar has won a total of $19,950 for his new owners. Entries for the next weekly bloodstockauction.com Aus & NZ Combined auction close on Thursday at 6pm with the team available to help you list your thoroughbred via contact@bloodstockauction.com or AUS Call 1300 849 349 or NZ Call 07 823 4117. “Send Us a Sign” breeding Red Element x Banner In the Sky (Jet Spur) who was a modest $4,400 inc gst at purchase on Bloodstockauction.com in October 2015. Send Us a Sign has since gone onto racing success and has now amassed over $40,000 in prizemoney. Its latest win was on the Sunshine Coast over 1200m making it 2 wins, a second and third in its past 4 starts. The horse has raced 3 times already this year showing great promise and soundness. A great result for another happy Bloodstockauction.com client. Congratulations! She has had 2 wins in Albury Racing Club, 1 win at Tumbarumba Race Course and also placed 3rd in Albury Racing Club. She recently won at Albury Racing club on the 16th February 2018. Illoura won the race by over 4 lengths and earned $11,085 in prize money! Find your next racing prospect: www.bloodstockauction.com or call our friendly team on AU 1300 849 349 NZ 07 823 4117! Harvey Bay’s Stellar Racing Career! Harvey Bay was purchased on bloodstockauction.com on September 15, 2015 to Adam Trinder Racing for $8,250 inc gst. Harvey Bay’s photo is courtesy of Adam Trinder Racing’s website. Adam Trinder was born into racing. He is the third generation of the famous Trinder family in Tasmania. He is the son of Michael and the grandson of Ray with all three men being inductees of the Tasmanian Racing Hall Of Fame. Adam has quickly established himself as one of the best trainers in Tasmania. Harvey Bay has notched up several impressive wins and places since being sold. Harvey Bay had three wins at Launceston on 25 November 2015 earning $9,100 in prize money; $9100 on the 8 March 2017, $9,100 on 12 April 2017 and with it most recent race winning $11,250 on 24 January 2018. Harvey Bay also had a win at Hobart on 23 April 2017 winning $9,100, as well as many second and third placings. Since being sold Harvey Bay has earned an impressive prize money total of $99,000. The latest bloodstockauction Australia & New Zealand auction again saw the popularity of racehorses again achieve top sales results with Muchas Coronas (AUS) a 5yo mare by ONEMORENOMORE, sire of ONE MORE HONEY and ONEMOREZETA, selling for $40,290! If you’d like help to list your thoroughbred contact our expert team on Call AUS 1300 849 349 or Call NZ 07 823 4117 and we’ll be happy to help. Introducing Lara Bowyer to our New Zealand Team! We would like to formally welcome Lara Bowyer to the New Zealand Bloodstockauction.com team. Lara has been heavily involved in the thoroughbred industry for a number of years, most recently working as an equine veterinary nurse for Matamata Veterinary Services. With a passion for the thoroughbred industry and experience in finance and business management, Lara’s primary focus will be client relationship management. She will be assisting members to better understand the online auction process, and most importantly helping them to unlock the full benefits of using our services. Lara is looking forward to meeting our New Zealand members in person, and working closely with them in the year ahead. Lara is based in Cambridge, and can be contacted on 0275600015 or by email at sales8@bloodstockauction.com. Victory Vibes Wins at Inverell! Victory Vibes a 3y.o. gelding was listed as unreserved and sold at our January 17th 2017 auction for $4,750. Since being sold Victory Vibes has returned over $16,295 in prize-money to his new owners. He has since gone onto win $3,340 on April 25th 2017 at Armidale, he ran 3rd at Gunnedah winning $1870 and most recently a win at Inverell on Jan 1st 2018 winning $11,085 in prize money. Bidding for our combined Australia & New Zealand Auctions starts every Tuesday at 7pm (AEDT). Entries for weekly auctions close every Thursday at 6pm (AEDT). Contact our expert team via contact@bloodstockauction.com or Call AUS 1300 849 349 or Call NZ 07 823 4117 who’ll be happy to help you with any questions or assist you with your listing. Since our launch in December 2014, Bloodstockauction.com is proud to have helped Agents, Breeders, Owners and Trainers to buy and sell thousands of thoroughbreds, across Australia and New Zealand. We consistently achieve great results for our vendors and buyers, with our average auction clearance rate above 70%. Having revolutionised the way thoroughbreds are bought and sold, Bloodstockauction.com continues to provide the best online auction platform within the industry, and is driven by continual improvement. We’re now holding Auctions weekly - 52 weeks of the year! · Final Auction Countdown starts every Tuesday at 7pm (AEDT)! Our expert team truly understand the thoroughbred industry and are available to help you write your ad so you achieve the best sales result. If you need any help listing your racehorse, broodmare, stallion, stallion cover, unraced, off the track, yearling or weanling, please call our expert team on 1300 849 349 and they will be happy to assist. Bloodstockauction.com Celebrates It's Third Anniversary! What an amazing journey it’s been for Bloodstockauction.com with just 27 Lots in our first auction, to now delivering on average 120 horses each and every auction. In June 2017, records were broken for the Bloodstockauction.com team, delivering a record 200 horses in a single auction! Celebrating its third anniversary this month! Bloodstockauction.com is the true pioneer of online thoroughbred auctions in Australasia, but it didn’t happen by chance. What began as an innovative idea which took three years of Research and Development before it was ready to launch. Bloodstockauction.com is proud to have revolutionised the way that bloodstock is traded in Australasia and around the world. An organisation that refuses to stand still, we believe that we can still do things better and deliver greater results to our loyal members. Without the ongoing support of our members, Bloodstockauction.com would not be the leader that it is today. You asked us for more … and we have delivered! We have now combined our Australian and New Zealand Auction Catalogues and we will be running weekly auctions 52 weeks a year. To celebrate three fantastic years in business, in appreciation of our members for their support, we are offering complimentary upgrades to kick off our new weekly auction! For this auction only, if you purchase a Silver listing package, you will receive an upgrade to a Gold package worth $550! If you purchase a Gold listing package, you will receive one complimentary Bronze listing to be used for your second horse in the same auction! Thank you to everyone that has been part of our journey, we couldn’t have done it without you. Delivering the sales ring to you! Australasia’s #1 Online Thoroughbred Auction site has an exciting announcement we’re now weekly with combined Australia and New Zealand auctions. We've listened to our member’s feedback and our auctions will now be conducted weekly! With a combined AUS & NZ Thoroughbred Auction Catalogue. Hopefully, with a less listings in a weekly format will make auction finish earlier on Tuesday nights. Also, our category order has changed and by popular demand the Racehorse section will be at the beginning of the Final Countdown. This very popular section will be up for auction first and trainers won’t have to stay up as late to bid on Racehorses. “We’re excited to bring this new combined Auction format to our Members. It will make it easier to list your thoroughbred with weekly auctions”, stated Director, Anthony Gafa. The entries closing times for the catalogue going Live will stay the same, every Thursday evening at 6pm (AEDT). List your horse with Australasia’s leading online thoroughbred auction site. Calling for listings for our next Australian Auction. Enter your horse by Thursday, 30 November at 5pm online or phone our friendly team on 1300 849 349. Stay tuned! Australasia’s #1 Online Thoroughbred Auction site has an exciting announcement to make. Buy or List your horse with Australasia’s leading online thoroughbred auction. Please join us in welcoming our new General Manager, Alan Biddle to the Bloodstockauction team. Alan brings with him a wealth of experience and knowledge. Alan has joined us in this newly created position follow a career spanning more than 15 years in the Franchising industry. Alan helped Cafe2U implement a strategy to fully franchise the mobile coffee business and grow it worldwide. Café2U has grown to over 240 Franchises worldwide. Prior to Cafe2U served in the Australian Army, discharging in 2002 after nine years’ service reaching the rank of Captain. During his period of military service Alan held numerous senior appointments, including sub-unit and unit command whilst on combat operations, as well as key advisory and observer roles to the United Nations (UN), and as Instructor Gunnery (IG) at Land Command. Between 2002 and 2004 Alan owned and operated successful Franchise Cafes where he became familiar with the operation, development and implementation of franchise systems and procedures. In March 2004 Alan was appointed General Manager of Cafe2U and commenced the process managing the concept from its creation through to fully franchising the business model. With the support of only a small team, Alan was able to manage the growth of the Cafe2U brand to more than 270 individual franchise outlets operating across 7 countries. In September 2014 Cafe2U was acquired by Retail Food Group Australia (RFGA) for $17M. At the time of acquisition, Cafe2U was the largest mobile coffee franchise in the world. Alan then spent time assisting First Class Capital to franchise its short-term lending business model, and taking it to market. In 2015, Alan was appointed CEO of the Chem-Dry franchise network and tasked with stabilising the network, redefining the model and product offering and driving change within the organisation. Alan resides in Sydney with his wife Amelia, and son Angus. Solar Lady has earned $35,125 in Prize Money since being sold at our 21st Feb 2017 auction. She was purchased for $6,500 and has since gone onto win twice at Grafton, once at Ballina as well as placing 3rd at Graton. American Icon, sold at our Feb 2015 auction for $3,575 and has since returned an impressive total of $48,450 in prize-money! This talented race-mare has achieved two 3rd places at Werribee & Moe Racing Club, one 2nd place at Werribee and three wins at Alice Springs Racetrack and one win at Stony Creek Racing Club! Baltic Prince (pictured) was purchased from our 4th July 2017 auction for $8,800 and was offered as unreserved. He has since achieved two impressive wins at Sunshine Coast Turf Club returning $19,500 in prize-money to his owners! That’s some Horse Power! Own a Piece of Racing Royalty, a relative of Championship Mare WINX! Bloodstockauction.com NZ has on offer a relative of WINX, Lot 2: Unnamed, 5 y.o. Mare closely related to WINX official. This impressive 5yo mare is by BUFFALO MAN (CAN), sire of BRIGHTON and PEACH COVE. She is out of a STRAVINSKY (USA) mare named Vegas Dancer (NZ) who is the half-sister to the dam of WINX in VEGAS SHOWGIRL. With racing royalty in her bloodlines, this mare has been bred with well-constructed pedigree and has untapped potential as a race mare or future breeding prospect. She has a lovely temperament and is easy to handle. For sale to dissolve a partnership. She is a close relative to Championship Mare WINX who has won an incredible 22 consecutive wins and 3 Cox Plates. WINX has been was touted as the world's best horse by the Australian Turf Club, with the 'best-of-the-best of the racing world' gathering on Saturday to witness the richest 2000m race. WINX’s 17th consecutive win at Royal Randwick in front of a crowd of 26,801. She blitzed her rival Hartnell with a win by over 5 ¼ lengths. Bloodstockauction.com offers a unique experience to Thoroughbred Vendors and Purchasers, with over 8,500 verified members, the regular online auctions ensure the widest possible audience is reached to bring thoroughbred buyers and sellers together. More Facts: Why use Bloodstock Auction? Launched in December 2014 after 3 years of development Bloodstock Auction has just celebrated their 100th Online Thoroughbred Auction. “We’re excited that we have reached 100 Auctions and our 101st Auction is now online with over 170 Thoroughbred’s on offer” said Anthony Gafa (Director of Bloodstock Auction). “Since our very first auction we have sold well over 5,000 horses with more than 1,000 horses sold this year just in Australia, and our clearance rate is over 70% and turnover has past $14 million. We’re very proud of the service we provide our members and to the Thoroughbred industry and reaching our 100th Auction was a fantastic milestone” said Anthony. Put this all together and you can clearly see why Bloodstock Auction remains Australasia’s Number 1 Online Thoroughbred auction site, despite several unsuccessful “copycat” attempts to replicate the business model and platform. Bloodstockauction.com Raises $50,000 for Ronald McDonald House – Westmead. “In conjunction with our 100th Auction, we’re also proud to announce that our partnership with Ronald McDonald House at Westmead raised $50,000 and we’d like to thank our generous Stallion Owners who kindly donated up to 100% of their Stallion Covers to support this worthwhile charity” says Anthony. Bloodstockauction.com are proud to present one of the biggest thoroughbred dispersal sales to be seen under online auction conditions. The current NZ catalogue features a genuine 36 lot reduction sale from the proud New Zealand nursery Dormello Stud. The highlight of which is Lot 25, the royally bred son of Redoute’s Choice in Duelled. This proven sire has produced Group1 winner SHOOT OFF amongst other stakes performers such as MARENOSTRO, St Leger winner GUNS AT FIVE, promising cups horse Bloodstream amongst others. There are 21 broodmares available on behalf of Dormello Stud, these include Lot 8- STAGE DOOR, a mare closely related to Group stars MR UBIQUITOUS and recent Group 1 Australian Derby winner JON SNOW. This mare by Keeper directly descends from multiple Group1 winning star SOLVEIG. She is offered in foal to exciting young stallion Bullbars on an early service. Other exciting commercial mares include Lot 19- Folies Bergere, a young O’Reilly mare in foal and out of star Group1 winning mare DASHING DONNA. Lot 3- Montdeux, is an empty Montjeu mare out a Zabeel ¾ sister to stakes performers Majestic Julia and Kim Majesty. Lot 6- Paxos is a young mare by prolific sire SAVABEEL, she is out of a half sister to Group1 winner HONOUR BABE and has her whole breeding career ahead of her. Also on offer is Lot 10- Saveadance. This exciting SAVABEEL mare is offered in foal and is a half-sister to 4 winners including Group 2 winner FIRE SONG. Lot 15- Chai Latte is a Danehill Dancer mare in foal on an early service. She is a half-sister to the stakes performed Sebring gelding Keen Venture and out of a half-sister to stakes winner ALLEZ FRANCE. Chai Latte is already the dam of a 3x winner and a 2x winner. In addition to breeding stock the feature of the horses in training from Dormello Stud is Lot 33- Lavish. This rising 3yo filly is bred to get better with time and has already been a trial winner and been competitive in strong 2yo races against stakes winners HARD MECHANDIZE and GOLD FEVER. She is in full work, sound and looks to be in for an exciting 3yo season for her new owners. This sale represents a great opportunity to acquire commercial stock for the upcoming season. There is a total of 36 lots on offer with the final countdown commencing 7pm NZT Tuesday 27th of June. Almarie delivered a special win at Ruakaka recently for Gemma Hewetson and her partner, trainer Clinton Isdale. Low-priced online auction purchase Almarie earned a special place in the hearts of Te Awamutu couple Clinton Isdale and Gemma Hewetson with victory in the $10,000 Ruakaka Beach Front Motel Maiden at Ruakaka. It was the first career training success for Isdale, an internationally accomplished horseman and a former jockey in Australia. He also shares ownership of the four-year-old Alamosa mare with his partner Hewetson, whose father is well-known Waikato horseman Robbie. Gemma Hewetson bought Almarie on Bloodstockauction.com in May last year, paying just $2875. At that stage she had started nine times for two minor placings, earning just over $2000 in prize-money. Since then Almarie has lined up in another 14 races, with this breakthrough win coming after a further six placings. Her prize-money earnings now stand at $15,975. A close last-start second at this course over 1200 metres, Almarie was sent out as the $9.60 third favourite in the 13-horse maiden field. She broke alertly from the starting gates and took the lead before rider Mark Du Plessis handed up to Teegeevee after about 200 metres. Almarie hit the front again at the top of the straight and quickly kicked clear, then showed plenty of courage in the last 100 metres to hold out the late challenge of the Logan-Gibbs runner Kyrie Eleison by a head. “It’s great,” Hewetson told www.theinformant.co.nz. “It’s a shame that Clinton couldn’t be here for this, but he’s at home doing all of the work! Bloodstockauction.com continues to outperform and maintain its status as Australasia’s No. 1 online thoroughbred auction. Bloodstockauction.com is 100% independently owned and operated and has over 100 Lots on offer in each of their fortnightly Australian auctions, as well as, a strong group of horses every fortnight in their New Zealand auctions. The bloodstockauction.com online auction platform goes from strength to strength. “But we can’t rest on our laurels and in recent months we have made a number of improvements and backend development of our site, as well as, having extra sales staff join us to ensure we continue to offer our members the best service” said Anthony Gafa (Director). “It’s an exciting process to watch horses change hands and be successful for their new owners and I’m always pleased with the excellent response we receive from very happy vendors as well” Anthony added. "The most rewarding aspect of the site is when people call us ecstatic with the results. They are so happy that they have been able to sell their horse without the usual costs incurred at traditional auctions." "With our platform there is no need for the horse to leave home until they are sold, thus saving on transport and staff costs. The risk of injury is diminished and horses can even stay in work during the process." "It is a given that owners, breeders and trainers really love the concept, especially because we do not charge commission on passed in lots." It has been a big year so far for bloodstockauction.com with highlights including the sale of horses by a variety of vendors including Swettenham Stud, Widden, Kitchwin Hills, Lyndhurst Stud, Clear Mountain Fairview, Larneuk Stud, Anthony Cummings and Bjorn Baker Racing. Bloodstockauction.com brings vendors and buyers together online very successfully with Australian auctions on the 1st & 3rd Tuesday every month and the 2nd & 4th Tuesday every month for New Zealand. The next Australian auction catalogue launches Thursday 1st June at 7pm (AEST) with the final countdown starting at 7pm (AEST) Tuesday 6th June, 2017. Stallion Directory - Choose - Compare – Select! The Stallion Directory on Bloodstockauction has proved to be hugely popular with breeders and is being used by an ever increasing number of stud farms as a key tool in promoting their stallions and to drive nomination sales. Stud masters are now realising just how valuable this Bloodstockauction.com facility is to them and the potential revenue it offers: Breeders are able to choose from a wide selection of stallions standing in Australia and New Zealand and can then compare up to three stallions at once with free access to extensive sire and broodmare sire reports, nicking reports etc. Studs can be contacted directly through our site to secure a stallion booking and Bloodstockauction.com does not charge any commission on nominations sold through our Stallion Directory. Choose - Compare – Select is the premise of our comparison tool and is one of the many features of our Stallion Directory that makes our product stand out from the rest. With over 8,000 members, four online auctions per month and a wide variety of services offered on our website, Bloodstockauction.com has truly become a one stop shop in the Thoroughbred breeding and racing industries. So, if you have not already done so then now is the time to list your stallions with us. Each package also includes one stallion cover listing to be auctioned at an auction of your choice (valued at between $220 and $550 depending on the package you have chosen). Bloodstockauction.com - Vendor Meets The Market! KRD Racing are offering 17 quality thoroughbreds for sale, which include racehorses, broodmares, weanlings and yearlings. Five of these lots are currently up for sale on bloodstockauction.com in the New Zealand Auction Catalogue with the final countdown starting at 7pm (NZT) Tuesday 25th April 2017. There are also 12 horses up for sale and open to negotiation with the full details available from bloodstockauction.com who can be contacted at the New Zealand office on 07 823 4117. Hot Saki is an exciting winning 3yo filly bred by Waikato Stud. Hot Saki was a winner when leading all the way over a mile at just her second start. She was then stepped straight up to 3yo staying stakes company where she wasn't disgraced behind EL EONORA. She has been spelling for a week and she is sure to return a lovely strong 4yo mare to take through the grades to cup class. The horses which are currently open for negotiation are listed below. Please click on the individual thoroughbred’s link to open previous auction details. Spring is in the air and the market is hotting up in preparation for the Australian breeding season. At this time of the year, when the racing is white hot and the Sydney yearling and broodmare auctions are looming, astute breeders are trading at the high end. Trading online is no exception, with Bloodstockauction.com’s current Australian auction featuring a lifetime share (2 services per year) in the hugely commercial young sire, Sebring. He currently boasts 61 stakes horses at present from just 5 crops of racing age. They include Group 1 winning entires DISSIDENT and CRITERION - both now commercial stallions in their own right. A young sire, Sebring has many more years of active stud service ahead of him. An extremely popular and fertile sire, Sebring has served an average of 189 mares per season in the eight years he has been at stud. His service fee last year (in which he served 185 mares) was $77,000. In 2013, Sebring covered 223 mares and their progeny are currently 2 year olds coming through this racing season. Sebring is currently a Top Three Sire of 2 year olds and 3 year olds, in addition to sitting comfortably in the Top 10 General Sires by winners and progeny earners. Sebring has 35 yearlings entered in the upcoming Inglis Easter Yearling Sale. His yearlings have fetched up to $730,000 this year and this price is expected to be surpassed at Easter. The lifetime share entitles the owner to two services per season for the stud life of Sebring in accordance with the Stallion Agreement. The owner is also entitled to dividends if applicable. Bloodstockauction.com’s fortnightly auctions cover all categories of Thoroughbred, from weanlings through to off-the-track horses. At this time of year, broodmares, weanlings and stallion shares start to compete with the ever-popular tried horses category for number of entries in each auction. The highly popular Stallion Nominations section starts to populate their auctions in the upcoming weeks. The auction is live until next Tuesday 4th April, with the Final Countdown commencing at 7pm AEST. Go to www.bloodstockauction.com to view. Bloodstockauction.com has always been known as the #1 Australasian online Thoroughbred auction, and it has been a year since we launched our first auction in New Zealand, with 2 auctions held every month. This year has marked a huge success and expansion for Bloodstockauction.com, the proven and independent platform for sellers and buyers looking for a unique online experience while buying & selling Thoroughbreds. “We are very happy with the success we have had so far in New Zealand’s Thoroughbred market, and we are definitely looking forward to more exciting auctions and further expansion in New Zealand”, said Anthony Gafa (Director bloodstockauction.com). So what has Bloodstockauction.com achieved in its first year in New Zealand? We have offered a huge range of Thoroughbreds in our New Zealand auctions, which are held every second and fourth Tuesday each month. This included Broodmares, Racehorses, Stallions, Yearlings, Weanlings, Off the Track horses and more. Each auction was an exciting new experience, with turnovers up to $162,000 per auction and clearance rates close to 80%. A one million dollar year? No, it’s even better. Our turnover for the first year exceeded $1.3 million dollars, with 307 lots sold throughout the auctions. 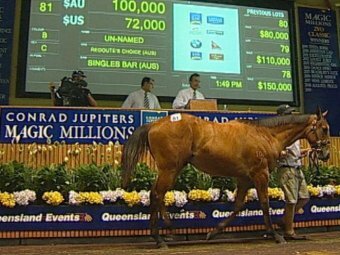 One Thoroughbred particularly shone, RAPID AS was sold for $70,000. While the list is huge, we can mention some of the Thoroughbreds that were sold for more than $30,000, such as PERANTO ($65,000), FEELIN’ THE LOVE ($30,500), HIRAPOUR ($50,000), COOL RUNNINGS ($65,000), TRIPLE JEOPARDY ($33,000) and the list goes on. What does Bloodstockauction offer for Thoroughbred buyers and sellers? In summary, we can say that Bloodstockauction.com provides the perfect opportunity for all Thoroughbred enthusiasts. Interesting and diverse catalogues are compiled for every auction, which is 100% online, with over 7,500 registered members. We have a unique community where purchasers & vendors meet to enjoy a unique online auction experience. This platform offers sellers control over their listings. They can choose to have a reserve price or sell their Thoroughbreds unreserved, and bidding starts at $400 for animal welfare reasons. Our site is visited by thousands of Thoroughbred Industry people every week. Our team will also enter the full pedigree and where applicable the race record will be added at no extra cost. There are three listing package options starting at $220 inclusive of GST. We also promote listings on our various social media platforms and newsletters (depending on the listing package chosen) which maximises the listing’s exposure. Tasmanian Thoroughbreds Sail Bass Strait! After a long night of bidding with 120 lots in the latest Bloodstockauction.com online Australian auction, we can definitely say it was a successful auction from all perspectives. Our Thoroughbred catalogue for this auction was very diverse, Broodmares, Racehorses, Off the Track horses, Unraced and Yearlings. It was great to see that we cleared 100% of the listed Tasmanian Thoroughbreds who are now travelling by sea across Bass Strait to their new homes. The highest number of bids were placed on the racehorse Hard Merchandise, which received 57 bids in the auction and sold for $14,250. He is by one of Australia’s leading young sires, HINCHINBROOK and out of stakes placed mare Solchow. For those passed in Lots we are hoping to find new homes in the next week, with the Bloodstockauction.com team working hard to close pending sales. We are now preparing for our 25th New Zealand catalogue which will launch Thursday March 22nd, and the final countdown for the auction will take place at 7pm (NZDT) on Tuesday March 28th. This catalogue marks our first anniversary in the New Zealand market, which was described as “even better than a million dollar year” by Anthony Gafa (Director bloodstockauction.com). Entries are now open for New Zealand’s auction. Bloodstockauction.com continues to be the world leader in regular online Thoroughbred auctions, with Australian fortnightly sales alternating with fortnightly sales in New Zealand. SWIFT REPLY Sold for $3.7K and has Already Earned Prize Money of $14.9K in a Few Months! Among many success stories for Thoroughbreds sold in the weekly auctions held by Bloodstockauction.com, comes the racehorse SWIFT REPLY who was sold on November 15th 2016 for $3,750. SWIFT REPLY sold after 18 bids, with Peter Cheers being the winning bidder. This 4 year old gelding has since run 2nd and more recently won at Armidale NSW, earning total prizemoney of $14,975. SWIFT REPLY had previously won at Wagga and placed at Canterbury as well as running 4th in races at Randwick, Rosehill and Canberra as a 2yo. This gelding is by highly successful sire, BENETEAU, who produced his first Group 1 winner with LASQUETI SPIRIT winning the VRC Oaks. Congratulations to all connections and we look forward to more success stories in coming auctions through our proven and independent platform, Bloodstockauction.com, Australasia’s #1 online Thoroughbred auction. Selling a Thoroughbred: Why Bloodstockauction? Bloodstockauction.com is a 100% online thoroughbred auction, with over 7,500 registered members we have a unique community where purchasers & vendors meet 4 times each month to enjoy a unique online auction experience. Thoroughbred categories include Broodmares, Yearlings, Racehorses, Weanlings, Unraced, Off the Track and more. This unique platform offers sellers control over their listings, they can choose to have a reserve price or sell their thoroughbreds unreserved, and bidding starts at $400 for animal welfare reasons. Our team will also enter the full pedigree and where applicable the race record will be added at no extra cost. Sellers can also choose which catalogue to list their horse, as the next 3 catalogues are open for entries. There are three listing package options starting at $220 inclusive of GST. We also promote listings on our various social media platforms and newsletters, depending on the listing package chosen, which maximises your listing’s exposure. Your listing will be viewable online in our Catalogue 5 days prior to the final countdown. There are no commission charges for horses listed unreserved if the sale price does not exceed $4,999. If a horse is sold for $5000 or greater a 5% commission is payable for total amount. Our clearance rates are continuously increasing so we keep breaking records regularly, all the results and bids are transparent to ensure we are providing the real prices by real people. If your horse isn’t sold, there is no pass in commission due at any time. Our auction is visited by thousands of Thoroughbred Industry people every week. Not sure if it’s the right platform for you to sell your thoroughbred? Give our team a call today and we will give you more reasons. We are available 24/7 to answer your calls on 1300 849 349. Margin Trader marks another success for Bloodstockauction.com and the new owners of this five-year-old gelding sold on our online thoroughbred auction for $43,252.5 after 69 bids last November, with Kendrick Racing Pty Ltd winning the auction. Since he was purchased, he has already collected total prize money of $23,600 in 2 different races, running 2nd at the CANADIAN CLUB BENCHMARK 75 HANDICAP race at Eagle Farm in February and winning at the RIC MCMAHON 2006-2007 CLASS 4 HANDICAP race at Eagle Farm last week. In February, Margin Trader came 2nd in the 1600m race, winning prize money of $10,800 and then the five-year-old gelding broke through at his third run for Kendrick Racing with a strong win in a Class 4 (1835m) on Wednesday, March 8, at Eagle Farm collecting the winner’s purse of $12,800. This is not the first time Margin Trader has won, previously winning at Bendigo, Echuca and Racing.com Park. Margin Trader is one among many success stories for thoroughbreds sold in the Australian & New Zealand online auctions on Bloodstockauction.com, “We’re looking forward to coming Auctions to mark new success stories for both Vendors & Purchasers” said Anthony Gafa (Director bloodstockauction.com). We had another successful Australian sale to kick off March’s auctions, with one of our listed horses selling for $51,500. After 28 bids, Ma Belle Cheval (Lot 29) who tested positive in foal to FOXWEDGE has now a new home. Ma Belle Cheval is out of a sister to NOM DU JEU (Gr.1 AJC Derby) and half-sister to JEU DE CARTES. The highest number of bids were placed on the broodmare Peltier (Lot 39), which received 52 bids in yesterday’s auction. She is the daughter of Stakes winning and Group performed mare COME FLY WITH ME by MORE THAN READY. “It was another successful auction where we had a turnover exceeding $300,000, and had more than 1500 bids. This asserts the market’s interest in Bloodstockauction.com as an industry leader for online thoroughbred auctions”, commented Anthony Gafa, Director of Bloodstockauction.com. We are now preparing for our New Zealand catalogue which will launch tomorrow March 9th, and the final countdown for the auction will take place at 7pm (NZDT) on Tuesday March 14th. “We are very excited for our next success story”, added Anthony. The full results for March 7th’s online thoroughbred auction can be accessed from here. Entries are now open for New Zealand’s auction. The catalogue will go online tomorrow evening March 9th. Bloodstock Auction Wows The Market! The most recent Australian Online Auction for Bloodstockauction.com cements the company’s ever-growing position as the No.1 online Thoroughbred auction both in Australia & New Zealand. In just one online auction on Tuesday 7th Feb, 139 lots went under the hammer and provided buyers with plenty of choice over the five different categories (broodmares, yearlings, racehorses, unraced and off-the-track) represented in this sale. 107 lots sold either on the night or in the two days since, resulting in a very healthy 80% clearance rate and grossing $512,400. There was a horse being sold on average every 77 seconds during the Auction’s Final Countdown. A maiden Snitzel mare for $19,250. Further passed in lots are expected to find new homes in the next week, with the Bloodstockauction.com team working hard to close pending sales. Bloodstockauction.com continues to be the world leader in regular online Thoroughbred auctions, with their Australian fortnightly sales alternating with fortnightly sales in New Zealand. Go to Bloodstockauction.com to see what’s on offer in their current New Zealand Catalogue. Welcome Lucy (left) and Liz (right) who recently joined bloodstockauction.com NZ and bring with them a wealth of knowledge, pictured here with Hamish our NZ stalwart. Over the coming months, all team members will be out and about, attending all things thoroughbred in NZ, such as the sales, trials and races. The Bloodstock Auction office is based in Cambridge in the Waikato and you can always phone (07 823 4117), or if you’d prefer one of our team members can come to you for a meet and greet introduction. $65,000 Result For New Zealand Auction. Bloodstockauction.com’s New Zealand auction on 24th January was highlighted by the sale of lightly raced 4 year old, Cool Runnings. A half brother to stakes placed stayer Vital Satin, Cool Runnings’ five starts culminated in a 1950m win on 18th January. In a hotly contested final few minutes of the auction, the winning bidder was Gold Coast based trainer, Patrick Busuttin who fought off a very keen bidder from Asia to claim the horse for NZ$65,000. Enquiries for future New Zealand Bloodstockauction.com listings can be directed to the NZ sales team on +64 7 823 4117. The launch last night of Bloodstockauction.com’s 15-stong New Zealand auction has several lots of particular relevance to Australia. Lot 9 is an unreserved yearling filly by BULLBARS, an Elusive Quality half brother to young Darley sires, HELMET and EPAULETTE. With his oldest progeny only 3 year olds, he has already produced stakes placed Sicario and Mongolianlightning as well as several other winners from his first crop of three year olds. This filly is a half sister to Sydney Group 2 winner FIRE SONG. Another very attractive yearling filly (Lot 8) is by Group 1 winner producer ROC DE CAMBES from the family of AJC Champagne Stakes winner, I LIKE DIAMONDS. Broodmares include Lot 4, a young daughter of NO EXCUSE NEEDED, sire of AJC Oaks winner DAFFODIL, already the dam of a stakes performer, one of two black type horses produced to-date by No Excuse Needed mares. Lot 6 is a perfect meld of Australian and New Zealand breeding. She is by top class broodmare sire FUSAICHI PEGASUS, damsire of seven Group 1 winners including Golden Slipper winner CAPITALIST. This mare is out of a half sister to TELESTO, BONANOVA and FRATERNITY. She is being vended by Regal Fern Lodge. They have five mares in the auction, four in foal to their young stallion LITTLE WONDER, a Group winning son of top class NZ sire, VOLSKRAAD. In the Racehorses section there is a 4 yo gelding by REDOUTE’S CHOICE’s stakes performed son, TOBIQUE. Lot 12 is a half brother to a stakes performer and this gelding has already won over 1950m in 5 starts. He is an attractive staying proposition. Remember JIMMY CHOUX? He won the ATC Rosehill Guineas, as well as a further four Group 1 races in New Zealand. His oldest runners are three and include Group winner MANOLO BLAHNIQ and two stakes placegetters. Jimmy Choux’s unraced 3 year old daughter Choux Envy (Lot 13), a half sister to Group placed Shining Light, is on offer. Out of a winning DANEHILL mare, she has a very realistic reserve. VRC Australian Cup and VRC Melbourne Cup winner SHOCKING is represented in the auction by Lot 14, a lightly raced, placed young mare. Shocking has already produced a Group 1 NZ Oaks winner in FANATIC. Bloodstockauction.com’s New Zealand sales have been very popular with Australian and local NZ buyers alike. The Bloodstockauction.com NZ team is growing - their mission is to visit every farm and racing stable in New Zealand to introduce them to the benefits of their proven online method of buying and selling Thoroughbreds. The auction runs until 7pm (5Pm AEST) next Tuesday evening. Go to Bloodstockauction.com to view the catalogue. If We Had a Crystal Ball! Congratulations to the many owners of star 2YO filly, HOUTZEN on winning the Magic Millions Gold Coast Classic on the weekend, pushing her total prizemoney to over $1.285 million! Her dam SET TO UNLEASH was offered and sold in Bloodstockauction.com’s March 15th auction last year, when Houtzen had only recently been purchased as a yearling. If only we all had a crystal ball! While the Magic Millions has been dominating headlines all week, Bloodstockauction.com has successfully launched another of their fortnightly auctions online. It is testament to the site’s popularity that despite many industry participants being busy either selling or buying on the Gold Coast at the moment, Bloodstockauction.com has managed to attract a balanced catalogue of 73 lots, with something for everyone. Broodmares in foal to popular first season sires include a Snippets mare in foal to Spill The Beans and a Dehere mare in foal to Scissor Kick. Foals at foot include colts by Poet’s Voice (a half brother to Moonee Valley speedster Go Down) and Cluster, the latter out of a lovely Commands mare back in foal to him. An in-foal mare by Choisir and a well bred young mare by Fastnet Rock are other highlights. The Racehorses section has a lovely range of unraced or lightly raced young horses by Northern Meteor, Snitzel, Al Maher, Dream Ahead, Rothesay, Master Of Design and two by I Am Invincible. Stakes placed, 6 time winner of over $200k, Lucky Symbol, is also offered. Regular vendors who have entered horses into this auction on behalf of clients include Lindsay Park Bloodstock, Matthew Smith Racing, John Sargent Racing, Singleton Racing and Matt Dale Racing. Successful syndicators Australian Bloodstock and OTI Racing are also represented by attractive lots in this sale. OTI Racing has had great success on the local and overseas stages, especially with its stayers. Australian Group 1 winners MANIGHAR, GAILO CHOP, BRAMBLES and KIBBUTZ head their long roster of stakes performers. OTI has entered 21 tried horses in various Bloodstockauction.com sales to-date, selling all but three of them for a very healthy 86% individual clearance rate. Bloodstockauction.com conducts two sales a month in Australia and two in New Zealand, with experienced sales teams in both locations. With a site membership just touching 7000 and growing daily, many more buyers and sellers are experiencing the benefits of trading horses with Bloodstockauction.com. Another great result for Bloodstockauction members! Another great result for Bloodstockauction members - Bullitt County was purchased for $5,000 from the August 16th 2016 Auction. Since being transferred he has run multiple placings and has had a total of 4 wins at Gawler and Morphetville, earning a total of $92,300! Well done and congratulations to the connections! With 4 Auctions per month - two in Australia and two in New Zealand - you may just find your next champion! Buy and sell through the proven and independent platform. Listing Tips: Why do similar pedigreed or performed horses sell for different amounts through online Auctions? Why do similar pedigreed or performed horses sell for different amounts through online Auctions? It often comes down to the photos and videos provided when listing the horse, like any product sold online, the buyer is relying on images to give them confidence to purchase and in the case of horses, to inform them of their conformation, condition and general appeal. A clear, well posed photo of a healthy attractive horse will sometimes sell for two or three times as much as a similar animal where the seller has taken a photo ‘over the fence’ of an unkempt horse, from an awkward angle or with its head in a feed bin. Read our valuable photography tips to ensure you showcase your horse and get the price is deserves! A recent trip to Asia by Bloodstockauction Director Anthony Gafa resulted in some exciting leads and great interest from Thoroughbred buyers looking for reliable new avenues. "The initial focus of the trip was to exhibit at the China Horse Fair, which gives equine industry participants the platform to showcase their products and services to a multinational audience," said Anthony. "Our stand was extremely popular and we were met with great enthusiasm by potential site users from several different countries. It was even more rewarding to meet up with people who were already members of our site and were very complimentary on its user-friendliness." Bloodstockauction.com exhibited alongside vendors from France, Japan, Sweden, The Netherlands, Argentina, Germany, Italy, New Zealand, Poland, Ireland, Belgium, Singapore and of course, China. With several developing Asian countries opening up their Thoroughbred breeding and racing industries, an alternative method of buying international horses with full disclosure was welcomed. "Australian and New Zealand horses have traditionally performed well in Asia and the expanding market opens up many selling opportunities forBloodstockauction.com's local vendors," stated Anthony. Also visiting Hong Kong, Macau, Singapore and Penang, Anthony was accompanied by one of his New Zealand team members and the two were kept very busy attending race meetings and liaising with trainers, owners and industry professionals over the two week trip. "Asian buyers have been impressed by the amount of information we and our vendors provide and that they have been assisted with organisation of travel and quarantine requirements by our staff." Recent Bloodstockauction.com sales have resulted in several 'ready to run' horses sell to Singapore; a stallion and unraced stock sell to Jakarta; and a Hong Kong buyer who purchased horses to initially run in Australia and New Zealand. "This trip has confirmed to me that Bloodstockauction.com can truly be a global company," said Anthony, "and that our next stepping stone is the booming Asian marketplace." Already with offices and sales teams in Australia and New Zealand, Anthony Gafa was also on the lookout for a suitable venue for an Asian office. The most recent Australian online sale saw a 'ready to run' 2yo Choisir colt sell locally for $55,000 and an Animal Kingdom 2yo gelding sell for an undisclosed amount to Singapore. Both had videos and x-rays available for viewing on the site and had previously been passed in through other sales companies. This auction, which launched with 107 lots, had a very impressive overall clearance rate of 87%, including 17 yearlings, which all sold. The next Australian auction will launch on the 1st December at 7pm and run through until the 6thDecember. To view the catalogue after launch, head to Bloodstockauction.com. While the name Anthony Gafa may not be overly familiar to all Thoroughbred industry participants, his burgeoning online business Bloodstockauction,com is certainly making an impact on their consciousness. Jane Henning writes - Some may imagine that Anthony, aged 39, is simply a successful businessman with a great idea, but he is no stranger to the racing and breeding industries in Australia. Unlike many major players however, he is not the product of a Thoroughbred industry family, nor has he stepped into the shoes of a wealthy relative. Of Maltese background, Anthony is the product of immigrant parents who individually migrated to Australia in the '60's before they met, not only aware that Australia was 'the land of opportunity', but also in order to remove themselves from an unstable country. A former Crown Colony of the British Empire, Malta was heavily bombed in the Second World War and had several changes of government through the following decades. Anthony's maternal grandmother was a wealthy landowner in Malta. "With no actual cash flow," explained Anthony, "she sold up all her property just to have the cash to buy one house in Chalmers St, Redfern – in those days a very working class area. It was a big terrace house with seven bedrooms over three levels and three kitchens. It was intended for the parents, six children and any future additions to the family through marriage." His maternal grandfather died early and his grandmother supported the six kids, still relying on the funds from the sale of land in Malta. "Everybody in the family worked hard and there was a refusal to rely on unemployment benefits to carry the family," said Anthony. Anthony's mother was the oldest daughter of six siblings and while in Malta, she had to stay at home and look after the younger children. She never received a formal education and went through her whole life unable to read or write, although she did learn to speak English. In those much less racially tolerant days in Australia, she was very protective of her younger siblings and being very 'tough' physically and mentally, was the go-to conflict resolver of the family. Anthony's parents met here and married. He was one of four children – the youngest and only son. Anthony's family had very little spare money while he was growing up. The children were all sent to private Catholic schools and there was no money left over for luxuries. "I remember taking toast to school when the bread was stale," said Anthony, whose Catholic faith is still very important to him. His Father, a printer who held two jobs, was a habitual gambler, 35 years ago losing and then winning back the $10,000 they had saved hard for to buy a house. Although there was always money for food, there were many weeks when his Father's whole pay had been spent. When Anthony was about seven years old, his family moved to Blacktown where his parents could afford their own house. While both parents were a great influence on his life, his mother was a very big personality. "She was the matriarch of our extended family, a great party person who was passionate about Aussie sport," he explained. She passed away in 1990 from breast cancer – a huge loss for Anthony. A resourceful child, it was evident early on that Anthony had an entrepreneurial streak. From a young age, he was impossible to beat at Monopoly – and that record still stands. "I would bulk buy lollies and hold guessing competitions at school to get extra money," said Anthony, "but my first 'official' job was commission-only, selling lollies for charity as a 13 year-old." Around this age he also started working with relatives who were carpenters and plumbers. His first three cars – all bombs - he earned as contra for work! Anthony left school in Year 10, eager to get out into the working world. He was very good at maths and science – not so good at English. "My Father insisted that if I wanted to leave school, I needed to get a trade. I applied for many jobs and ended up with an electrical apprenticeship." Anthony has since lost his Father to cancer. During his apprenticeship he scrimped and saved to secure money for a house, working for a large firm for the first four years. "I could count on one hand my weekends off over that time – I was on a mission," Anthony recalled. He started investing in property, a passion he still follows today. He then set up his own business, AJG Electrical, with his sister Tanya as his first office employee. Tanya had been driving him to job interviews and otherwise supporting his progress since a young teen. The business became a very large concern, however it wasn't all plain sailing. "I lost a huge amount of money through some of my builder clients going broke during the GFC and had to remodel the business to make it non-reliant on large builders," he explained. Anthony first became interested in racehorses around 20 years ago. At the same time, martial art was a big part of his life. "From the ages of 13 to 25 I was very involved in kick boxing – I taught voluntarily and didn't drink at all during this time, although I'm making up for that now!" he joked. "I also played soccer for ten years, following in my Dad's footsteps." Anthony had always loved horses and developed a great admiration for the Thoroughbred. He was impressed by their strength and athleticism and loved to hear them come thundering up the track. Anthony married his long term girlfriend Sara when he was 28. Also a very hard worker, Sara is a key person in the day-to-day running of Bloodstockauction.com. In 2005 a cousin phoned Anthony and suggested they buy a yearling up at the Gold Coast June sales. Anthony contacted leading trainer Tim Martin and asked for his help. As Tim wasn't attending the sale, he put Anthony in touch with Vin Cox (an independent bloodstock agent at the time), who showed him the ropes and helped him buy yearlings. The first time Anthony walked into a yearling sales complex, he was captivated. "I was already very familiar with and keen on property auctions, and the auction process is what most interested me in combination with the actual animal," said Anthony. Their first horse was the Desert Prince gelding, 'Our Contender'. After only three starts for Provincial placings, he was spelling at a farm and suffered a life ending accident. Anthony decided he would like more control of the process and decided to buy his own farm. Vin Cox was instrumental in helping him not only buy horses, but also inspect properties. Anthony and a couple of mates got together and bought the beautifully bred racehorse Dubai's Choice, a former $1.8m yearling. Sold by Darley through a tried horse sale, the group bought him for $110,000 and left him in the care of Tim Martin. "Although he had joint issues, Dubai's Choice went on to win a race in Sydney and place in Melbourne for us, which only made me keener than ever to get further involved," said Anthony. At this stage in his working life, Anthony had his own successful electrical contracting company, property interests and a recruitment company. In 2007, Anthony took that next step into the Thoroughbred industry and bought a farm in the Hawkesbury. Previously a Standardbred stud, major construction began. Anthony renamed it 'Jomar Park', a compound of his parent's names, Joseph and Mary. The property has developed into a boutique broodmare farm, and a home where Anthony and his family currently live. Always very focused on having his own family, Anthony now has three children - Mary, Eva and Anthony Jnr. Anthony's core motivation in business is to be able to provide for his children at any level. His family and culture feature as the key elements in his life. "I'm first and foremost proud to be Australian but I'm also a very proud of my heritage," he states. Meanwhile, the attraction of the horse auction never diminished for Anthony. Having bought and sold at auctions for a number of years by this time under his own banner, he started to think that a technological take on this method was the way of the future. "I was sitting out on the back veranda having a beer with my mate Craig Weeding and we started to develop the concept of the online auction house," Anthony explained. "We knew what we wanted and how the product needed to be delivered." That night, Anthony placed ads to recruit a permanent team for what became Bloodstockauction.com. The very next day, an additional office was set up in Anthony's existing premises and the focus was completely on this new business. Never doing less than 12 hours a day, the two business owners and a core development team went to work to build a world-first dedicated regular Thoroughbred auction platform. Always knowing the potential of the product and having conducted information nights with different industry groups, it was then evident that delivery of Bloodstockauction.com had to be brought forward. A pre-launch road trip in the eastern states towing an overgrown trailer with big signage, the two partners were enthusiastically received. Their first auction commenced with just 27 lots and a clearance of 85%, a percentage the business still regularly achieves. Anthony had high growth and expedient delivery ideas, whereas his business partner wanted to see the auction grow organically. "An amicable commercial decision was made and I bought Craig's share of the business," he explained. Anthony appointed a new General Manager immediately and continued to forge onward. They rapidly outgrew their old premises at Bella Vista, then Windsor, and late last year moved into a brand new purpose-built office in Mulgrave, just outside Windsor in The Hawkesbury. Within a year, Bloodstockauction.com's twice-monthly Australian auctions had hit 192 entries in one sale. Ever seeking to grow the business, a New Zealand office in Cambridge was opened in February 2016 with three permanent staff, their first sale launching in mid-March. Auctions are currently conducted four times per month alternating between Australia and New Zealand. The site has over 6000 members and the business has 17 staff and counting. Recent crowd-pleasers among both advertisers and visitors to the Bloodstockauction.com site have been the addition of a Stallions Directory and a Syndications page. Another spin-off of the site is the creation of Horsetransporter.com.au, a website which allows people to effectively call for quotes at no cost, for horse transportation Australia-wide. "It's no secret that my goal is to be the world's best Thoroughbred auction house, online or tradtional," Anthony declared. "I've already upset a few big players by my presence, but I've always been inspired by a challenge – I love to offer a great service and prove that things can be done." Anthony is not only a licensed stock and station agent, he is also an auctioneer for property, his other passion. Meanwhile, Anthony's home, Jomar Park now has a foal watch house, a 14 box American barn, 12 day yards, 12 paddocks, an 8-horse walker, a round yard and parade area. He is currently installing a training track. Always keeping his own broodmares at home, he also has stallions standing externally and a portfolio of commercial stallion shares. Anthony has a small team of racehorses which he spreads between a number of trainers. Other horses Anthony has bred or raced include Architect (a stakes placed multiple metro winner of $456,00), Nisos (a stakes placed multiple metro winner of $216,500) - both bred by Jomar Park – and Supercoach ($202,665), a tried horse bought by Anthony on theBloodstockauction.com site and which won three in a row with Bjorn Baker last campaign. Stating that he is success-driven rather than money-driven, Anthony doesn't live an opulent lifestyle. "I love to hang out with the kids on the weekend and I have a regular beer at the local pub. I'm close to my three sisters and really enjoy living in The Hawkesbury." This ex-tradie from humble beginnings is now dedicated to the ongoing success of Bloodstockauction.com. With Asia in his immediate sights, the meaning of the company's motto, "Delivering the Sales Ring to You" is taking on an ever widening geographical scope. Stay tuned for his next move. A world leader in online Thoroughbred auctions, Bloodstockauction,com introduced their highly successful selling platform to New Zealand back in March and since then, both buyers and sellers have been reaping the benefits. Vendors were understandably tentative at first, for while Bloodstockauction.com's Australian catalogues had been steadily increasing in size and quality, it was a brand new concept for New Zealand at the time. Some vendors have grasped the concept of 'pinhooking' on the site, buying what they spotted as bargains at traditional auctions or on an alternate online selling platform." Those bought at public auction and then resold on Bloodstockauction.com include Christine Louise – bought for $400 and sold for over $8,000; Silvara – bought for $5,250 and sold the following week for $9,487; Goodn'targ – owned by Graeme Rogerson, she was passed in at public auction and successfully sold online 6 days later. Horses offered on another online platform also enjoyed more success via Bloodstockauction.com.Zadoree – passed in previously – sold for double the reserve; and Lava – bought for $1000 - sold only 6 days later for $5,500. A Mastercraftsman filly advertised on Trademe.co.nz for $1,000 was sold on Bloodstockauction.com for $4,887 and Dragonkeeper – advertised unsold on several other platforms, sold successfully on Bloodstockauction.com. Other great results for vendors on Bloodstockauction.com include Rapid As , a 4yo maiden mare by Tobique which sold for $70,000; Hirapour , a 1 win Tavistock gelding, selling for $50,000; and Peranto , a Per Incanto gelding selling for $65,000. Those listed with modest expectations were also pleasantly surprised. A yearling colt with a reserve of $3,000 sold for $14,250 and a yearling colt with a $1,000 reserve sold for $17,250! Vendors have not been the only winners on the site. Buyers have also been the beneficiaries of some canny purchases. Chateau Maroux – a lightly tried last start winner which sold for $10,000 was imported to Australia and has won her only outing to-date – a competitive Rosehill trial. Pacific Choice purchased for $11,787, won a $30,000 race only a month later. The Rich Lister , purchased on the site after a declared bleeding attack for only $600, won first-up for his new connections. Leading NZ farm Chequers Stud are fans of the site. "We have found Bloodstockauction.com a great tool for the NZ industry. Not only have we managed to turn over stock for good money, it has also generated new horses and clients on the farm visiting our stallions," owner Chris Campin said. "It is a streamlined, easy process and I would not hesitate recommending anyone to list a horse with Bloodstockauction.com." Bloodstockauction.com holds two auctions per month in New Zealand and two in Australia, offering around 300 horses in total monthly. The site has offered an average of 54 lots in New Zealand per month, while in two of those seven months, 61 and 65 lots were offered. Bloodstockauction.com has three full time representatives based in Cambridge and they are on a mission to visit every industry participant on each island. Bloodstockauction.com's next New Zealand sale launches on 6thOctober and is currently open for entries. The current Australian auction running online for Bloodstockauction has some nice stock which is of interest to commercial breeders and pinhookers. A highlight of the bloodstockauction.com catalogue is young ANABAA mare Nothin’ Leica Storm. She is in foal on her first season at stud to sire-of-the-minute, WRITTEN TYCOON on a mid-September service. A winner, Nothin’ Leica Storm is a half sister to Fashion Rocks, who was purchased by Aquis Farm for $160,000 this year, in foal to HINCHINBROOK. Fashion Rocks' first foal, a SNITZEL filly, sold as a Magic Millions yearling this year for $400,000 to the bid of Gai Waterhouse. An imported GULCH mare – the dam of recent Rosehill winner Dark Eyes – is offered in foal to 15/16 Champion Queensland Second Season Sire, ROTHESAY. Other broodmares include an ENCOSTA DE LAGO mare in foal to ZOFFANY; a stakes producing ROYAL ACADEMY mare in foal to TIME FOR WAR; an ELUSIVE QUALITY mare – a half to 2yo stakes winner JACKSON ; a dual stakes producing half sister to two Group 1 winners; and the dam of a stakes performer in foal to BEL ESPRIT. The racehorse section, which carries 28 lots, also has some nice dual purpose mares, one a winning 5yo HIGH CHAPARRAL mare out of a stakes winning half sister to two other stakes winners, and the other a SEBRING mare who was a $170,000 yearling. 13 individual stallion covers include those to DANE SHADOW, ONEMORENOMORE, DUPORTH and GOOD JOURNEY. A 21-strong weanling section features a colt by popular young stallion YOUR SONG out of a Group 3 winner and a DELAGO DELUXE filly out of a full sister to CINQUE . Some of these appealing lots are being offered unreserved and there is also the reduction sale of a commercial breeder. With this auction straddling the Horse’s Birthday, what were entered as weanlings or yearlings last week are now another year older, despite their category title. The auction is currently live and continues through to this Tuesday evening, the Final Countdown starting at 7pm AEST. Visit bloodstockauction.com to view the catalogue and bid. Our Valdivia was purchased in our April 5, 2016 Australian Auction for $49,500. That’s total prize money so far of $81,650! City Winning and Multiple City Placegetting Victorian Miler! The current New Zealand-based Bloodstockauction.com sale has some exciting entries. Launched last night, it features several lots of interest for breeders as well as those looking for tried and potential racehorses. DRAGONKEEPER is a young stakes placed mare, a winner of five races, who has retired sound. She is a half sister to three other winners including multiple stakes placegetter, Headsup and closely related to Group 2 winner SPURNED. A nomination to Group 1 winning Redoute’s Choice sire, NADEEM is on offer. His progeny has had Group success in both NZ, Australia, South Africa and UAE. Already a multiple stakes winner in Hong Kong, his son STERLING CITY took out the Gr.1 Dubai Golden Shaheen, boosting his prizemoney to over $10.5 million. In Australia, SHARNEE ROSE, HAPPY GALAXY, AMMIRATA, SAVOUREUX and TARGET IN SIGHT have kept the Nadeem flag flying. Another highly appealing stallion nomination is to young sire, PER INCANTO. Amongst NZ stallions, only SAVABEEL exceeds Per Incanto’s mark of seven new stakes performers in 2015/16. He is currently leading the NZ Second Season Sires by Winners List with 29 for the season. In Australia, Per Incanto’s yearlings have been highly popular and have sold to $310,000 (13 offered, 12 sold). In the Racehorses section, there is a lightly raced 4 yo mare who has won her last three starts with a combined margin of over ten lengths. JAYLA MONET has had a let-up since her last win and has just returned to training in fine fettle. Lightly raced four-year-old Tavistock mare LIN has some nice form around her. A sound racing proposition, she also has good breeding value, with five half sisters already at stud going to commercial sires. A last start winner by 4.5 lengths, the 3yo Swiss Ace gelding RED ACE has just come back into work, ready to add to his 3-start record. Unnamed and / or unraced stock includes TURBULENCE, a Showcasing 3yo full sister to two winners; a 2yo SWISS ACE gelding who is a full brother to a winner; and a 2yo recent jumpout winner. The sale continues through to next Tuesday night, the Final Countdown starting at 7pm NZ time (5pm Australian Eastern Standard Time). To look at the catalogue go to Bloodstockauction.com. Not enough has really been said about how successful this business has been. It's a great concept and Anthony Gafa is a driven and smart business man and many don't know how much he has invested in the thoroughbred industry before this business has taken off. Great to see someone with vision and who is helping breeders and owners actually make more money with less expenses coming out of their pockets. Bloodstockauction's current Australian catalogue reveals an eclectic and interesting group of horses amongst the 117 lots. Predictably, with the breeding season commencing in only two months, there are plenty of entries in the Bloodstockauction.com Broodmares sections (45). They include a half sister to SMOKIN' JOEY and OUR SMOKING JOE; an EXCEED AND EXCEL half sister to JEREZANA; a Melbourne winning half sister to PLATELET; a Group 3 winning NZ mare; and a mare whose progeny make the top sales - in foal to REWARD FOR EFFORT. Amongst the 13 Stallion Covers on offer over three states is a nomination to top class young sire, STAR WITNESS. Currently the top ranker on the Leading Second Crop Sire by Winners (42), he is running a very close 3rd in the Leading Second Crop Sire by Earnings, only $9k behind current 2ndplacegetter, BENETEAU. The highly fertile Star Witness has covered big books every year and has a lot of progeny coming through to further enhance the value of the future foal from this nom. The Racehorses section also has some intriguing offerings, some with an international flavour. There is a lightly raced, winning French-bred filly closely related to PRINCE CHERI ; a 2yo UNCLE MO metro trialled colt that is BOBS Extra; a 3-time winning imported GB middle distance gelding; and a Melbourne placed 2yo I AM INVINCIBLE filly. Their New Zealand sale, which completed last Tuesday, saw some good results with a lightly raced, dual placed 3yo filly topping the sale at NZ$70,000. She will head to Warwick Farm, NSW to continue her racing career. This sale tops other healthy prices for tried horses recently achieved in their New Zealand sales, with figures of $65,000, $50,000 and $30,500 following on. The current Bloodstockauction.comAustralian auction runs through to next Tuesday night, with the Final Countdown commencing at 7pm. Bloodstockauction has now been successfully operating in New Zealand with fortnightly auctions since mid-March. The Bloodstockauction.com has now been successfully operating in New Zealand with fortnightly auctions since mid-March. With the concept being enthusiastically embraced by vendors and buyers alike, the innovative online auction company has come up with some encouraging results to-date. Prior to the dedicated New Zealand auctions, class NZ performer WARHORSE was sold via a Bloodstockauction.com auction for $275,000. It's no secret that New Zealand's tried racehorses are in demand in Australia and Asia. Horses are sold either under the virtual hammer on auction night or by their Cambridge-based staff in the days immediately after the sale, when underbidders on passed in lots are contacted and enquiries fielded. PACIFIC CHOICE – 5-time winning SNITZEL mare sold to an undisclosed buyer for $10,025. RIP VAN WINKLE yearling colt – sold to a NZ owner for $10,500. The Australian-based Bloodstockauction.com sales going from strength to strength, with catalogues routinely carrying well over 120 horses with some in the high 190's. Director Anthony Gafa expects that New Zealand sales will follow the same trend in ratio to its Thoroughbred production. "We all know that the Kiwis breed some of the world's best horses and we are keen to get the word out to a much wider audience. Selling their horses online with a platform with proven results is the way that New Zealanders will no doubt go forward,” explained Gafa. Anthony Gafa (Director) of Bloodstockauction.com was recently interviewed by NZ TAB Trackside Radio, listen in as he discusses the future of bloodstockauction.com in New Zealand. Due to popular demand, the Bloodstockauction team travelled to Perth last weekend to conduct a couple of seminars on the whys and wherefores of selling Thoroughbreds through the highly successful online auction platform. While the Bloodstockauction.com team, headed by Director Anthony Gafa, did expect to stir things up, the weather that coincided with their arrival was gale force. Their Saturday evening function at Ascot Racecourse was well attended, despite several last minute apologies due to trees down and lack of power on properties. The Western Australian Thoroughbred industry has special issues associated with the distance from other breeding and racing centres, transportation and the diminishing size of the industry in the state. Growing a network of buyers and sellers within the state as well as facilitating stronger connections externally were some of the key topics covered. The low cost, regularity of auctions, quick payment features and established success of Bloodstockauction.com were features well received by the audience of breeders, owners and trainers. A seminar was also held on Sunday at Bunbury Racecourse in WA’s South West, which was also very well received, with wind-blown participants rolling through the door. Further visits to WA are planned for the team, whose warm reception indicated a real need for a viable selling and buying alternative in the state’s racing and breeding industries. MELBOURNE Cup winning jockey Pat Hyland, who still rides a few of his gallopers in track work at Cranbourne, has been recognised for his lifetime association with racing with induction into the Australian Racing Hall of Fame. The 74-year-old, who turned to training more than two decades when he retired from race riding, started his apprenticeship the day before his 15th birthday with the late trainer Jim Moloney who was inducted last year just before his 90th birthday. And it was business as usual on Tuesday for Hyland who rode 30 Group 1 winners, including What A Nuisance to victory in the 1985 Melbourne Cup. Six days a week he is up at 2.45am to prepare for track work. “I rode work this morning,” Hyland said. “I suppose it will catch up with me one day but it’s great. Former Queensland jockey Noel “Digger” McGrowdie, who won the 1957 Melbourne Cup on Straight Draw is among the 10 newly inducted members announced who will be honoured at the Australian Racing Hall of Fame induction ceremony in Adelaide on Friday. McGrowdie, who rode winners Australia-wide, was killed in a car accident during a riding stint inMalaysia in 1961. Four horses Leilani, Luskin Star, Merman and Sydeston and two trainers _ Neville Begg and Cecil Godby _ will also be inducted, along with journalist/author Les Carlyon and Joe Brown. Racing Victoria chief executive Bernard Saundry paid tribute to Hyland and Carlyon. “They now stand side by side among an elite group of people that have devoted themselves to our sport and I would like to personally thank them for their contribution in making Victorian thoroughbred racing great.” Saundry said. “Pat is one of Australia’s greatest ever jockeys whose career spanned more than 30 years in the saddle, riding more than 2,300 winners. Among his achievements he has won some of the country’s most coveted races in the Melbourne Cup, Caulfield Cup, Cox Plate and the Golden Slipper. As well as this he has gone on to become a successful trainer in the industry. For the first time this year, all Australian Racing Hall of Fame members will be celebrated at all of Saturday’s feature race meetings Australia-wide, including Flemington, Rosehill, Doomben, Belmont Park and Morphettville. Pictured: Former top jockey Pat Hyland outside the jockeys rooms at South Australia’s Morphettville Race. Mebourne Cup winner Hyland has been inducted into the Australian Racing Hall of Fame. Va Pensiero’s reserve reduced to $225,000. As instructed by the owners, the son of STRATUM, an exciting dual group winning sprinter can be secured prior to being offered in the 19th to 24th of May New Zealand auction. An opportunity to secure a REDOUTE'S CHOICE line sprinter for the upcoming season. Contact 1300 849 349 to take advantage of this rare opportunity. Offered for sale on Bloodstockauction’s current New Zealand auction, Group I winner Pondarosa Miss had a pedigree update over the weekend when her full brother Ecuador won the Listed ATC Lord Mayor’s Cup at Rosehill. The Gai Waterhouse trained Ecuador led throughout to win the 2000 metre staying test by a length and a half. The six year-old son of High Chaparral (IRE) has the overall record of seven wins and eight placings from 26 starts earning over $635,000 in prizemoney. Ecuador and Pondarosa Miss are the best of four winners from Bak Da Princess, a half-sister to Group II winner Bak Da Chief. An innovation launched before last year’s breeding season, the sale of stallion nominations online at Bloodstockauction.com was a great success. A total of 172 stallion nominations were offered in their twice-monthly Australian auctions last year, selling 138, from highly sought-after commercial sires right through the stud fee range to stallions standing for less than $5000. As the 2016 breeding season approaches, studs and shareholders are again starting to list stallion nominations on the site, the attraction being that they receive payment within 48 hours of the end of the sale. Accordingly, buyers can expect to snap up a nomination for less than the usual fee. In Bloodstockauction.com’s current auction, the highlight nomination is to top class sire, Sebring. Recently announced as standing for $77,000 and with a tightening on his numbers, he looks set to have the ‘Book Full’ sign up in the very near future. Last season, Bloodstockauction.com sold two noms to Sebring for $58,850 and $54,450 respectively, however the current offering has already exceeded that price, sitting at $60,000 plus GST and meeting reserve within the first 12 hours of the sale. With bidding open until next Tuesday, it will be very interesting to see what the nomination sells for. Auctions are now conducted every week, alternating between Australia and New Zealand, and stallion nominations from studs based in both countries can be offered in either catalogue. Awapuni Racing Centre New Zealand played host on Anzac Day to Bloodstockauction.com’s New Zealand staff, Director (Anthony Gafa) and their invited guest. Sponsoring Race 4, the Bloodstockauction.com Maiden, proved to be popular for all concerned, and congratulations goes to the connections of the winning horse Peranto. Peranto is trained by Roydon Bergerson, owned by D.P. & Mrs K.C. Fleming and the winning Jockey was Hayden Tinsley. The popularity of Bloodstockauction sales online sales continues to grow. Now alternating week-to-week with its New Zealand auctions, the Australian based saleBloodstockauction.com which launched last Thursday night is composed of a record-breaking 192 lots. "Our highest number of entries previous to this was 124 lots. This is a significant increase, which is proof that more and more vendors are finding true value by using Australasia’s number one online Thoroughbred auction,” said Bloodstockauction.com’s Director, Anthony Gafa. The sale is comprised of 84 broodmares (32 in-foal and six with foals at foot), 66 tried racehorses, 22 unraced, ten yearlings, three stallions, two stallion covers, two weanlings and three off-the-track horses. and a City winning Victorian miler. The previous week has seen some impressive results involving graduates from Bloodstockauction.com sales. They include SUPERCOACH, an entrant in their first sale 16 months ago, who recently completed a hat trick of wins for Bjorn Baker, his most recent win being at Warwick Farm on Easter Monday. At the time of sale he had won $48,000 in prizemoney - he has now won over $200,000. Encosta De Lago filly SMOKIN’ VALENTINA (a three-quarter sister to SMOKIN’ JOEY and OUR SMOKIN’ JOE ) sold as an unraced 3yo last July and won at her fourth start for her happy owners at Cranbourne on Friday night. At the lower cost end of the scale, SUSSEX STREET was bought through the auction house as a maiden last April for $2,250 and has since won four Queensland races and over $34,000 in stakes, her most recent win being last Friday. Other winners last week to have found new homes through the site include CRYSTAL COURT, STRILING SHADOW, HUMANISE and TIVERTON. The current 5-day auction completes this Tuesday night (5th April) with the first lot going ‘under the hammer’ in the Final Countdown at 7pm – to browse the catalogue and bid now, go toBloodstockauction.com. New Zealand’s first ever online Thoroughbred auction will launch this Thursday night, when Bloodstockauction.com’s debut Kiwi catalogue goes live. After 15 months of highly successful twice-monthly sales in Australia, Bloodstockauction.com’s New Zealand office is in operation and the company is excited to present the country’s renowned Thoroughbreds to a worldwide audience. The inaugural sale features a select group of horses with appeal not only to Kiwi owners, breeders and trainers, but also to Australian and Asian buyers. “We have an unraced, trial winning three year old gelding entered and very wisely, the vendor has had recent x-rays taken to conform to Singapore requirements,” said Bloodstockauction.com’s Director, Anthony Gafa. A lightly raced three year old filly by TAVISTOCK (sire of this year’s Rosehill Guineas victor and triple Group 1 winner, VOLKSTOK’N’BARRELL and Victoria Derby winner, TARZINO) is another feature of the sale. “As well as Ready To Run prospects, trial winners and yearlings, there is some very appealing breeding stock on offer as well,” continued Gafa. A mare with a filly at foot by PER INCANTO (whose yearlings have made up to $310,000 when selling in Australia) and a mare in foal to TAVISTOCK are noteworthy. The twice-monthly New Zealand auctions will end on the second and fourth Tuesdays of every month, alternating with Bloodstockauction.com’s Australian auctions on the first and third Tuesdays, resulting in the release of weekly catalogues on the innovative site. The first New Zealand catalogue launches on the site on Thursday at 7pm New Zealand local time, which is 5pm Australian Eastern Standard Time, with the Final Countdown on the evening of Tuesday March 22nd. To view the catalogue post-launch, go to Bloodstockauction.com. Caulfield Cup runner-up and multiple Group winner Dandino (GB) is being offered for sale. A stunning near-black stallion, Dandino (GB) needs no introduction for Australasian racegoers. He arrived in Australia with a highly impressive international record, havingraced successfully in England, USA and Canada and with a Gr 2 (Jockey Club Stakes), a Gr 3 (September Stakes) and a Listed win (American St. Leger Stakes) as well as a Gr 1 second (Canadian International Stakes) and a further eight Group and Listed placings even before he landed on Australian soil. He adapted beautifully to Australian conditions, running second in the Caulfield Cup (beaten 1.25 lengths by FAWKNER) at his first start here as a Spring Carnival visitor in 2013. Following recovery from a suspensory ligament injury, Dandino came back to stay in September 2015. After a couple of meritorious runs in the Gr 1 Underwood (beaten 2.85 lengths) and the Gr 1 Turnbull Stakes (beaten 0.95 length) and running second in the Gr 3 Geelong Cup, Dandino went out on a high note by winning the Gr 3 Queen Elizabeth Stakes at Flemington in November. A son of top class sire DANSILI (GB), Dandino has won approximately $2 million racing in Great Britain, Germany, Hong Kong, Japan, USA, Canada and Australia. A winner from 1800m to 2700m, over his career Dandino has raced against some of the world's most successful middle distance performers and his globetrotting success is testament to his professionalism and toughness. A recurrence of his suspensory injury has forced the decision to retire him from racing. Dandino is offered as a superb breeding prospect. Dandino is an outstanding type standing 16hh, has a wonderful temperament and possesses a desirable pedigree. His sire DANSILI is a highly successful sire, having produced among others the Prix de l'Arc de Triomphe winner RAIL LINK(now at stud). His son HARBINGER was officially the Highest Rated Horse in the World in 2010. He is the sire of 19 Group 1 winners of 32 individual Group 1 races. 26% of his stakes winners are at Group 1 level! Dansili's 2016 stud fee is 85,000 Euros. Dansili is a son of Danehill, who needs no introduction as a 'breed shaper' in this country and overseas. Dansili is also an emerging sire of sires, with his son ZOFFANY (Ire) who shuttles to Australia for Coolmore Stud, siring his first two Southern Hemisphere 2 year old winners recently. With his oldest only two year olds in both hemispheres, he has gotten off to a very strong start. He is a highly popular sire in Ireland having already produced several Group and Listed winners. His 2016 Irish stud fee is 45,000 Euros. In the Northern Hemisphere, Zoffany's yearlings have sold to $475,000, while at the recent Magic Millions Gold Coast sale, a Zoffany colt realised $300,000. Dandino’s half sister has produced stakes placegetter and 2 year old winner in France, No Education. This is the family of French Group 1 winner, LYPHARITA, a full sister to Dandino's granddam. As Lot 28 in Bloodstockauction’s catalogue, he is currently available for bidding online, with the auction completing on Tuesday 2nd February at 7pm Sydney time. Log on to www.bloodstockauction.comto register and bid. The innovative online Thoroughbred auction house Bloodstockauction continues to impress. Bloodstockauction.com goes from strength to strength. With its fortnightly auctions regularly sitting around 100 entries over all categories from broodmares through unraced, tried and even off-the-track Thoroughbreds, both buyers and sellers have embraced the format. Darren Dance, Owner / Director of the highly successful syndication company, Australian Thoroughbred Bloodstock, is a happy vendor. Buyers are also finding the process easy and efficient. John Walter recently signed up as a member and bought a 3-year-old BOBS maiden from a Sydney stable in the very next sale. Bloodstockauction.com’s Director Anthony Gafa is understandably pleased with users’ responses, however he is not resting on his laurels. What a weekend it was!. For graduates of www.bloodstockauction.com- winners galore! At Morphettville on Saturday the Grant Young trained Celtic Prince outstayed his rivals in the 2500m event, quickly winning for his new owners more than what they paid for him just a few weeks ago. Latenight Princess also provided a quick return for her new owners, at just her second run for them finding the line strongly to break her maiden at Yarra Valley on Saturday. She too won more than she cost! As did Madame Ginoux, a $2500 bargain who has won her last two for the Tanya Parry stable - doing a great job under the steadier of 58.5kg on Saturday. Purchased in early June for $2000, Mountain Promise was also a winner on Saturday and she has won over three times her purchase price. Four Iron was also in the winner's circle on Saturday and has now won two in a row. In great form since his purchase in mid-May, he has amassed well over 20 times his $1700 auction price. And on Sunday Spinning Crown won his maiden, earning $5400 having changed hands for a mere $600. "Six winners in two days is an outstanding result for our clients," said Bloodstockauction.com director Anthony Gafa who added that "it is a great time to sell race horses and yearlings as evidenced by our impressive 86.7% clearance rate at our last sale." Conducted on November 17, that sale was a highly successful one with a sale topper of $115,000 - recent Rosehill winner Mr One Eleven. Both sellers and buyers have been delighted with the results of our sales with Next Level Bloodstock's Eric Pipersberg (purchaser of Latenight Princess) thrilled with his first buy. "I could not be happier," he said, adding that every two weeks he "really looks forward to having a look through the new catalogue." "With Latenight Princess already winning back her purchase price I have no hesitation in buying again. It has been a great result for us." Bloodstockauction.com has also been a success story for sellers with John Sargent thrilled with the $115,500 (after a massive 73 bids) received for recent Rosehill winner Mr One Eleven. Also pleased is Baker Racing (also vendors of Celtic Prince) who sold Marvelous Ceramibo to Jane Gollan for $50,250 whilst Ron Johnson sold Darciwood to Brooke Bowen for $15,000 on behalf of Hawkes Racing for a group of happy owners. At their our most recent sale conducted on December 1, promising three-year-old Axion sold for $51,150 to Kirkup Racing. Garry Kirkup has been a regular buyer at bloodstockauction.comand is full of praise for the site. "It is a great concept and easy for country trainers who don't have the time to get to the tried horse sales." "The frequency of the sales is great and we also like the ability spend days leading up to the sale doing some research." From March Bloodstockauction.com will also be operating in New Zealand and entries are being taken. Next Level Bloodstock, the new kid on the block in the world of Syndication had winner Number One on Saturday with it's first ever purchase Latenight Princess. The burgeoning company, headed by Eric Pipersberg, took a punt on the tried daughter of High Chaparral (IRE) who had a less than modest start to her career with Kris Lees, then Todd Howlett. He paid $10k for her on bloodstockauction.com and syndicated her quickly to owners who were keen to have a shy at the stumps. At the very least they'd have a mare with residual value being from a very well related daughter of Redoute's Choice. Sent to Leon and Troy Corstens, she relished the beach spell at their Malua Pine Lodge, Balnarring. First up she wasn't helped by a mad leader bias at Geelong when a fair 4th over 1300m, but today, courtesy of a copy-book ride by D. Gauci and the extra trip, she outgunned Lee Freedman's odds-on fav to win a 1500m Maiden at Yarra Glen. She is only a compact little thing but she has a big ticker, just like the heart that adorns her racing colours. Two of the owners in her are Frank Cotela and Peter Raff who, in partnership created the massive Stereosonic Music Festival, which coincidentally is playing in all capital cities this weekend. Frank was at the Sydney event and Peter at the Perth show so were unable to be on track to watch her. Bloodstockauction has a million dollar aim - the company's director Anthony Gafa is thrilled that the online sale has already seen its graduates amass over $550,000 in prizemoney. "Our next target is the million," said Gafa who added that it has been an exciting process to watch horses change hands and go onto good success for their new owners. And he has been pleased with the response from very happy vendors. Bloodstockauction.com's latest sale was a particularly successful one with Gafa noting that "it is a great time of year to buy and sell horses." Marvelous Ceramibo was the subject of 52 bids last week, the consistent Encosta de Lago gelding selling for $50,250 to trainer Tony Gollan's wife, Jane. On the same evening, multiple city winners Darciwood and Celtic Prince were sold, both as unreserved lots - giving buyers a great chance to give talented horses a new home. Purchased by Ewan Watt for $24,000, Celtic Prince is a five times winning son of O'Reilly who showed his class by running second to Who Shot Thebarman in last year's Group One Auckland Cup. Also stakes placed, Darciwood is a smart sprinting half-brother to the Group Three winning, Melbourne Cup placed Maluckyday. This latest successful sale is part of a big year for bloodstockauction.comwith other highlights including the sale of Group One winning stallion Warhorse (a horse who had been listed with agents for months) for $275,000; two Sebring covers including one for $58,850 purchased by Anthony Cummings after 51 bids; and stallion Red Arrow for $25,850 when he had previously been listed elsewhere for less. Tried horses Sigmund ($33,550) and Wow Factor ($28,050) have also sold well as have commercial broodmares such as Symphony Strings (in foal to Fiorente) and Good To Be True (a half-sister to Smokin' Joey in foal to Choisir). Nominations to such stallions as Savabeel, Sebring, Americain, Puissance De Lune, Time For War, Monaco Consul, Equiano, Moshe, Stryker, Dane Shadow, Duporth, Statue Of Liberty, Squamosa and Red Dazzler have been listed. Horses have been sold by a variety of vendors including Eliza Park, Swettenham Stud, Arrowfield, Widden, Willow Park, Kitchwin Hills, Emirates Park, Lyndhurst Stud, Clear Mountain Fairview, Craiglea Stud, Larneuk Stud, Bullarook Park, Brett Cavanough Racing, Anthony Cummings, Bart & James Cummings, Bjorn Baker Racing, Gerald Ryan, Tony McEvoy, Tim Martin, Robbie Laing, OTI Racing, Slade Bloodstock, Joe Lanteri and Bert Vieira. "We are bringing the vendor and the buyer together online very successfully. This is the power of the bloodstockauction.com platform." Judging by its success, the Bloodstockauction online Thoroughbred sales model is here to stay. Bloodstockauction.com held their first auction nine months ago with 27 lots, including the subsequent Casino Cup winner Sigmund, which attracted 109 bids and sold for $33,550. "To-date we have sold horses for up to $275,000," said Bloodstockauction.com's Director, Anthony Gafa. "At last count we have sold in excess of ten Group winners including Group 1 winners and we have some of Australia's biggest breeders and trainers using the site and supporting our business." In recent times, the twice monthly auctions have been attracting entries around the 100 mark, with the highest being 113 to-date. Categories include tried racehorses, broodmares, weanlings, yearlings, unnamed and untried stock as well as off-the-track Thoroughbreds. "The sale of stallion nominations has been very popular," said Gafa. "We were pleased to sell two Sebring covers in separate auctions for up to $58,850." "We are now exceeding 20 nominations to individual sires per auction leading up to the breeding season. We've recently listed popular stallions such as Savabeel, Americain, Puissance De Lune, Toorak Toff, Dane Shadow, Statue Of Liberty, Equiano, Duporth and Moshe." Some are purchasing mares as well as stallion nominations to match. Frankie Stockdale recently bought Group 2 winner Maitland Gold (in foal to Magic Albert) on the site as well as a nomination to Melbourne Cup winner, Americain. "I'm very happy with what I've bought so far," said Frankie. "I get on every auction and bid on a few. I've won three nice horses at the right money." Dawn Giltinan was the buyer of Estrella Flicka in foal to Reset recently, as well as a half sister to Smokin' Joey in foal to Choisir in a previous sale. "I've been upgrading my mares and I'm very happy with my buys on Bloodstockauction.com," said Dawn. "Once I've bought a horse, I can go straight to the Horsetransporter.com.au link on their site and request quotes to transport the mare. I've bought two tremendous broodmares and would definitely buy again through the site. I'll be watching each auction." Estrella Flick's seller Kylie Stephenson commented that, "The main reason I chose to auction her online was that it is less stress on the horse, being sold out of her own paddock. I was paid quickly and she has gone to a lovely home." "The website development team has recently been upgrading the functionality to cope with heavy demand. During this time, we've had a couple of issues which necessitated extension of the auction," said Gafa. "Even the world's largest companies have occasional website hiccups; these growing pains are a symptom of high growth, which I look at as a positive moving forward." Anthony Gafa explains that an additional benefit of the site is that, should a horse not meet reserve, the sales staff contact underbidders and endeavour to negotiate a sale price to the satisfaction of both parties. "Often the passed in price may be only one or two bids off reserve and during the week following the auction, the clearance rate regularly rises to over 70% - due largely to the after-sale efforts of the staff." Bloodstockauction.com has sales completing on the first and third Tuesdays of every month and their current five-day auction ends this Tuesday night (1st September) at 7pm. As any auction house will attest, racehorses are popular year-round, while broodmares and stallion nominations are more seasonal and that season is now. This is reflected in Bloodstockauction.com's latest catalogue, which is currently live, culminating on Tuesday (21st) at 7pm. Lot 2 - A full sister to Group 1 winner Triple Honour in foal to Equiano, who had his first metro 2yo winner at Moonee Valley this week. Lot 11 - A maiden Galileo mare from the family of Redoute's Choice, Spinning World, Denon, Aldebaran and Good Journey. Lot 14 - A well related young Foreplay mare in foal to the exciting Camelot. Lot 20 - A full sister to Our Smokin' Joe and Smokin' Joey in foal to Choisir. To complement this bevvy of broodmares are nominations to 14 individual stallions including proven sires Duporth, Pendragon and Dane Shadow, young sires such as Tickets and Dreamscape and debut stallion, Rock Hero. Many of these nominations are unreserved. Two stallions are also offered for sale in the form of The King's Cross (a Redoute's Choice half to Charge Forward) and Keano, a stakes winning son of Pins out of a half sister to O'Reilly. Lot 58 is a robust and well bred weanling by Choisir out of Listed and Group 2 placed mare Ma Chienne is the only baby in the sale. The 21 tried racehorses include several Provincial performers including Lot 67, 3yo gelding Zizumba and Lot 79, three-time Provincial winner Mosscat. Rocca Santa is a royally bred Fastnet Rock winning 4yo mare (Lot 84) is another standout. The unraced section offers some really interesting stock. It includes Lot 90, a Medaglia D'Oro colt out of a metro winning mare, and Lot 93, a Commands full brother to multiple stakes winner Kanzan. Lot 92, Rosie On Ice is a filly by Hinchinbrook out of a half to Ain't Seen Nothin' . Near the end of the sale but worth waiting for is Lot 94, an Encosta De Lago three quarter sister to Smokin' Joey and Our Smokin' Joe. Make sure you log on to www.bloodstockauction.com well before 7pm on Tuesday night to ensure you are a part of the action! It's another great catalogue being presented by bloodstockauction with its current sale final countdown commencing on Tuesday evening - the company's biggest and best yet with 113 quality lots, beautifully timed with the breeding season rapidly approaching. On offer is a wide variety of young horses, tried gallopers, broodmares and for the breeder a handful of stallion nominations and with the catalogue live online for five days before the sale there is plenty of time for research. Throw in a stallion as well, the triple Group winning Dreamscape - a beautifully bred son of Choisir from the family of influential stallions Sadler's Wells, Thatching, Nureyev, Fairy King and Northern Meteor. With his oldest runners just three, Dreamscape has it all ahead of him and he is the sire of a number of promising gallopers including the stakes placed Bugatty and the in-form Hammond Lane. What a better time of year to secure an up-and-coming young stallion?! Lot 3 Divine Hope: a multiple city winning Prego mare whose six to race have all been winners including the Gr.3 winning sprinter Commanding Hope. Due September to Darley's Street Cry stallion Carlton House. Lot 7 Flight Of Dreams: dam of four winners from as many to race including the Gr.3 placed city winner Flight Of Pegasus. This daughter of Flying Spur is a half-sister to the high class Singapore galloper Recast and the local stakes winner Gonski. Lot 9 Good To Be True: due in September to the mighty Choisir, she is a three times winning Brief Truce half-sister to the Gr.1 Goodwood Handicap winner Smokin' Joey and the dual Group winner Our Smoking Joe. Lot 16 La Soeur Noir: stakes placed multiple city winning half-sister to the Perth Cup winner Black Tom. Lot 20 Masked Romance: due late August to Exceed And Excel's four times Gr.1 winning son Excelebration, she is a half-sister to the dual Gr.3 winner Blackrock College. Lot 21 Miss Matera: a half-sister to the Listed winner Cassis from the family of her grandsire Zabeel, this daughter of Lonhro is due mid-August to Wanted. Lot 37 Snippets' Jewel: what a great job Snippets mares have done at stud producing 80 stakes winners. This girl has produced five winners from six to race and one of her daughters is the dam of the recently retired dual Gr.1 winner Miracles Of Life. Lot 44 Thawaabet: city placed juvenile winner in foal to one of Victoria's most popular young stallions, the triple Gr.1 winner Helmet. Joining those mares are daughters of Danehill Dancer, Encosta de Lago, Johannesburg, Canny Lad, Royal Academy, Montjeu, Choisir, Hussonet, Octagonal, Oratorio, Domesday, Umatilla, Viscount, Written Tycoon, O'Reilly, Falvelon, Rock Of Gibraltar, Flying Spur, More Than Ready, Darci Brahma, Good Journey and Danzero. Other highlights include the stakes placed five times winner Regal Thunder, the city winner Echo Berry (in foal to Sidereus), four times winner Etoile Rouge (half-sister to the Gr.3 winner Vibrant Rouge), the times winner Hello Hello (in foal to Ustinov), six times winner Kistamon, Monistique (half-sister to stakes winner Umaquest), Newcastle Miss (two times winning daughter of the Gr.3 mare Patterns), Amber Trinket (half-sister to the Gr.2 winner Amberino in foal to Domesday), the city winning Redoute's Choice mare Clasp and the Gr.2 placed Illinois Girl. Bound to prove popular with buyers are weanlings and yearlings by Star Witness (half-sister to W.S Cox Plate hero Maldivian), Stryker (half-brother to the dam of the multiple Gr.1 winner Appearance), Drumbeats, Strategic Maneuver, Ustinov, Haradasun, Oratorio, Al Maher and Kaphero. Meanwhile the tried racehorse market continues to thrive and there are plenty of options at the sale including the seven times winner Game Of Shadows, the three times winner L'Uccello Rosso, the lightly raced four times placed 4Y0 Mar Nero, the Any Suggestion 4Y0 My Anahera who ran well at only his second start at Bendigo in May, the three times Sunshine Coast winner Overrule, the six times winner Pointing To Gold, the well related Fastnet Rock mare Rocca Santa, last start Toowoomba winners Serala and Attraction (who broke her maiden by a stunning 6 3/4 lengths on June 12), last start Bathurst winner Abbalac and the Ascot winning Bel Esprit mare Coco Cash. Be sure to log into www.bloodstockauction.com and start researching your next buy! With each online sale conducted by bloodstockauction the word is spreading that the company is providing a great alternative to the traditional sales ring. With money saved by both vendor and buyer - neither of whom have to leave their computer - the concept is being extremely well received to the point where this week's auction has attracted record entries. Kicking off on Tuesday evening at 7pm, a strong catalogue of 61 stallions, stallion nominations, broodmares, youngsters and tried and untried horses is bound to be of great appeal. Stallion covers are new to bloodstockauction.comand what a way to start with five nominations on offer - two to high class proven stallions who are almost fully booked. Golden Slipper hero Sebring, sire of 13 stakes winners including the Royal Ascot bound Criterion, has proven extremely popular with breeders since the day he retired to Widden Stud and interest in him isn't waning with the handsome chestnut serving 192 mares at a fee of $60,500 last spring - and this year he will be just as popular at $66,000. Waikato Stud's W.S Cox Plate winner Savabeel is just as much in vogue, serving 184 mares last spring. Due to stand at NZ$100,000 (plus gst) this year, he has been well represented by 42 stakes winners. Also on offer are nominations to the in-form Turffontein - whose success has seen his fee rise from last year's $7,700 to $11,000 - the speedy Danzero stallion Kaphero and the well related Redoute's Choice stallion Dubai's Choice. A couple of stallions will also be auctioned - Mouro and El Cumbres. An imported son of outstanding Gone West stallion Grand Slam, Mouro - a half-brother to the recently retired Hong Kong star California Memory - won two Group 3 races for the Tony McEvoy stable, displaying a good turn of foot winning over a variety of distances between 1400m and 1800m. A dual Group One winner in South America, Hussonet's son El Cumbres is looking for a new home having stood at Mornmoot Stud, Victoria. Lot 8 JADE TEMPEST (by Danehill Dancer): a $100,000 yearling, she is being sold in foal (an early service date of September 26) to exciting Group One winning Fastnet Rock stallion Your Song who stands at $22,000 at Widden Stud. Lot 21 ACID STORM (by God's Own): a young full sister to the stakes placed Thunder Rain, she is in foal to $11,000 stallion All American, Group One winning conqueror of So You Think. Lot 22 BURNIN' LOVE (by Untouchable): a granddaughter of the dual Group winner Petite Amour served by the proven Redoute's Choice stallion Bradbury's Luck - and the foal will be a 3/4 sibling to the dual Listed winning four-year-old In Cahoots. Lot 24 BAZARUTO (by Northern Meteor): served on September 1 by the regally bred Tickets, she is a half-sister to the dual stakes winner General Peekay. Lot 38 CEDA MISS (by Encosta de Lago): a consistent Hawkesbury winner not far away in town at her most recent outings, she has dual purpose value with her dam being a half-sister to the four times Group One winner Dance Hero. Lot 55 TRADE MARKER (by Snippetson): having had only eight starts this fellow has plenty of upside. Close up at each of his last three outings, he will race at Hawkesbury on the day of the sale. Lot 56 UNIQUE DREAM (by God's Own): a Sale winner who has raced well over middle distance and staying trips, he has handled rain affected and dry tracks. Was not far away over 2200m at Pakenham just last week. Another horse bound to prove popular is the unraced three-year-old Ma Deuce, a Domesday gelding with a real look of his handsome sire. Placed in two Rosehill trials earlier in the year, he was only just beaten by the promising Miss Denni at Rosehill a couple of weeks ago. Be sure to check out the catalogue now at www.bloodstockauction.comand be at your computer on Tuesday for an exciting online sale! Opportunities to secure Group One winning stallions do not come along every day and bloodstockauction.com's Anthony Gafa is delighted to be offering the high class Warhorse (Tougher Than Ever) for sale on Tuesday evening. To be auctioned as lot 20 in a particularly strong online sale, the five-year-old had already attracted 59 bids by Monday afternoon and Gafa is confident that he will be in strong demand. "We have had feedback from around the country with a number of good judges hoping to secure him." Kicking off his racing career as Warhorse, the son of outstanding stallion General Nediym was one of the best two-year-olds in New Zealand winning the Gr.1 Diamond Stakes and Gr.3 Eclipse Stakes as well as running eye-catching placings in the Gr.1 Sires' Produce Stakes and the Listed Karaka Millions. Continuing to race in the best of company at three, Warhorse won the Listed Bonecrusher Stakes and was third in the Gr.1 NZ 1000 Guineas won by Sacred Falls. Also proving competitive in Australia where he has raced as Tougher Than Ever, the bay has been three times placed at stakes level and after a recent trial victory is one of the fancies for Wednesday's Listed Wangoom at Warrnambool. Described by his NZ trainer Jason Bridgman as a horse with "a blistering turn of foot," Warhorse is one of 48 stakes winners sired by the dual Gr.1 winning sprinter General Nediym and he hails from a proven stallion family with his dam a half-sister to the sadly missed California Dane. Also from this family is the multiple Gr.1 winner Broad Brush, hugely successful sire of 91 stakes winners. Whilst Warhorse is the highlight of Tuesday evening's sale there are plenty of other options for keen buyers with 72 lots to go under the virtual hammer. Those in the market for a broodmare will be interested in lot 1, Autumn Dawn, a half-sister to this season's stakes winner Tried And Tired - topweight and favourite in the Wangoom on Wednesday. Flying Spur is doing the job as a broodmare sire and his daughter Composure is another sale highlight. In foal to the in-form Turffontein whose service fee has now gone up, she is the dam of the stakes placed Cash For Matt and she is a half-sister to the Singapore star Ninetyfive Emperor and the local Gr.2 winner Testa My Patience. Tough race mare Loves Long Journey is another bound to attract attention as the three times winner is being sold with a colt at foot by the Melbourne Cup winner Americain, one of Victoria's most popular young stallions. Lonhro's progeny are always popular and no wonder as they just try so hard! His daughter Martindale Hall is a city placed four times winner and this impressive looking mare is a daughter of the Gr.3 placed juvenile Romantic Flyer. Rory's Jester mares have done a great job and his daughter Ora Smytzer, who has a real look of her sire, is a half-sister to one of the very best Australian bred mares, the wonderful Sun Classique - a four times Gr.1 winner in South Africa and Dubai. From the family of the legendary Century, Ora Smyzter boasts a perfect record with her first four foals all winners. The tried racehorse market is strong at the moment and there are some likely prospects at bloodstockauction.com including Starcraft mare Clown Around who was a close up Muswellbrook fifth at her debut late last month. Dashaboy looks a terrific prospect for Queensland racing having been close up at recent Geelong and Werribee meetings whilst the consistent From The Valley has also been in consistent form - looking ready to win again soon. Attractive chestnut Heebites is another with his hoof on the till, the Excites a strong finishing second at his most recent outing at Queanbeyan. Artie Schiller mare Lady Schiller just doesn't know how to run a bad race and having just missed out on the prize at Gatton a few weeks ago she is another who will easily find a new home. As will the promising Ring True who could not have been more impressive racing away to a 2 3/4 length victory at the Gold Coast on April 29, swamping his rivals from the rear. And for those looking for a maiden galloper with potential, Rappell is an appealing prospect, the Haradasun four-year-old a last start Kempsey second with a win close. Bloodstockauctioncom's seventh online sale is the company's biggest yet - a record number of 56 horses to go under the virtual hammer next Tuesday evening from 7pm. And there is quality right from the start with the opening lot being a Gr.3 winning mare in foal to Victoria's most popular stallion, the dashing Melbourne Cup winner Fiorente. Senorita Dame, winner of the Gr.3 Desert Gold Stakes and the Listed Canterbury Belle Stakes, is a daughter of Senor Pete and the Gr.3 mare Snadame. Lot 2 also hails from a good family, in fact she is related to the darling of the Australian turf, The Launderer having on her pedigree page the great Black Caviar. A mare with a real look of her globe-trotting multiple Gr.1 winning sire Starcraft, Hoshi is an unraced broodmare prospect, a daughter of the stakes placed Dai Ichi whose grandam is the Caulfield Cup winner Imposera. Monaco Princess , who has a colt by the handsome Mulaazem at foot, is also on offer and she is a half-sister to a recent legend - the dual W.S Cox Plate winner Fields Of Omagh. This is a prolific black-type family that has also produced current star filly Fontein Ruby. Also being sold with a colt at foot by Mulaazem (a Gr.2 winning half-brother to hot young stallion Sepoy) is Miss Thunder, a half-sister to the triple Gr.1 winner Northwood Plume. Other appealing broodmare prospects include the city winner Matilda Princess by the outstanding broodmare sire Snippets, the proven broodmare Zip Zapper (dam of city winner Bonzerina), sisters or half-sisters to the stakes winners Racer's Run, Winger Charger and Star Shiraz and daughters of Testa Rossa, Octagonal, Red Arrow, Mister C, Fusaichi Pegasus, Sequalo and Iffraaj. Also looking for a new home is imposing black stallion Unusual Suspect, a Gr.1 winner of the Hollywood Turf Cup and nine other races - a horse who also proved competitive in Australia, winning the Listed Werribee Cup and finishing close up in the Caulfield and Melbourne Cups. There is a variety of young horses available including weanlings and yearlings by Al Samer, Beautiful Crown, Rothesay, Skilled, Hussonet, All American and Von Costa de Hero as well as a son of the in-form I Am Invincible. As usual the tried racehorse section is strong with eight times winner Alfiler (by Pins) and seven times winner Faverock (Falvelon) bound to attract attention as will the dual city winners Eminent Domain (by Exceed And Excel), Caballo Rapido (Husson), Emotional Outburst (Johannesburg) and Five O'Clock (Dane Shadow). Others worth a look at include the multiple provincial winners Sweet And Savage, Tumult (by Exceed And Excel), Bimbiarra and Final Dream as well as the lightly raced placegetters Bulldog's Pride, Feelin' The Heat (by Not A Single Doubt), Hard Rock (Stratum) and Outback Wrangler. The team at bloodstockauction are gearing up for another busy sale with forty broodmares, racehorses and untried stock on offer. The catalogue www.bloodstockauction.com is up and running online, giving potential buyers plenty of time to do their research before the auction kicks off at 7pm on Tuesday March 3. Recently retired mares are always popular with breeders and there is a nice selection up for grabs. Winning her last start by 4 1/2 lengths and injured in the running, Proposition is a Pendragon mare from the family of Japanese star Seeking The Pearl and VRC Oaks/1000 Guineas heroine Magical Miss. A yet to be named daughter of Snitzel is out of a granddaughter of the high class race and broodmare Skating, dual Gr.1 winning dam of the stakes winners Murtajill, Sunset Run and Bradbury's Luck and grandam of one of this season's star two-year-olds in Vancouver. Pour de Vrai is by Lonhro out of a Flying Spur mare from the immediate family of dual Gr.1 winner Shamekha and the outstanding stallion Brave Warrior. Batar Girl by Bureaucracy is a tough and honest mare, the winner of three and seven times placed. Her dam is a half-sister to star filly Angst. And Heavenly View with her four wins and 11 placings was also durable whilst Jetting To London is a lightly raced two times winner whose dam is a half-sister to the Flight Stakes winner Only A Lady. More Than Ready is not surprisingly making his mark as a broodmare sire and his daughter Pegasus Miss, from the family of NZ champ McGinty, has a bit happening in her pedigree being a half-sister to unraced youngsters by Northern Meteor and Snitzel. Imported mares are in favour and Quick Pik is a granddaughter of one of the greats of the European turf, two times UK Horse Of The Year Dahlia who was as good a broodmare as she was a racehorse - producing four Gr.1 winners. For those after a proven broodmare the record of Shazatak cannot be faulted - five foals, all raced, all winners! And as a lovely bonus she is being sold with a colt at foot by one of Victoria's most popular stallions, the Melbourne Cup hero Americain. Also boasting a 100% record is Bettencourt, a daughter of outstanding broodmare sire Last Tycoon. Half-sister to the stakes winner Pantenny, she has had three winners from as many to race including the metropolitan winner So Nonchalant. Shopping Spree, in foal to Ustinov, has already produced three winners and she is a half-sister to the Listed winner Snippets Crown, dam of Gr.1 filly Unearthly whose daughter Invest is also a big race winner. Zip Zapper meanwhile has produced the city winner Bonzerina and she is a Vettori daughter of the dual Listed winner Regina Madre, dam of speedy Listed winning juvenile Fashion Cafe. The latest catalogue for bloodstockauction now online and it is a sale of considerable depth with something to please every potential buyer!. Kicking off with the broodmares, the auction offers a very nice range of breeding prospects including Thunder Rain, a two times stakes placed mare in foal to the classy and reliable Magic Albert hailing from a family that Bart Cummings has enjoyed plenty of success with - her relations including the Gr.1 sprinter Gold Trump and the Queensland Guineas winner Coolong Road. Proposing by the wonderful stallion Pentire is a proven broodmare already represented by three winners. A full sister to the dual Group winner Zanna, she is out of the Listed winner Posing - dam of the NZ 1000 Guineas heroine Ad Alta. City winner Slinky Naninda served by the well related Redoute's Choice stallion Niconoise will also be sold as will the proven broodmare Yellow And Black, dam of the Listed winner Boudi Woudi. Half sisters to stakes winners are always in demand and there are several on offer. Autumn Dawn by the underrated Ne Coupez Pas is a two times winning half-sister to the recent stakes winner Tried And Tired whilst Beyond The End is a half-sister to the dual Gr.3 winnner Neena Rock who looks set for autumn carnival glory after resuming with a great run in the Breeders Classic last weekend. Meanwhile Elle's My Girl is a half-sister to the Frances Tressady Stakes winner Five All and Galileo Rosie by Galileo is a half-sister to the durable Gr.3 galloper King Kool Kat. Many breeders are fans of the daughters of stakes winning mares and up for sale next week is the imported Forty Winks (in foal to Equiano) whose dam is the dual Gr.2 winner Dilly Dally. Also on offer are daughters of Charge Forward, Octagonal and Shamardal and mares served by the likes of Top Echelon and Bullet Train. Those in the hunt for a stallion prospect should take heed of Town Of Dragon. Fourth at Listed level, the metropolitan winner is by Australia's most prominent sire of sires in Redoute's Choice whilst his dam is the Gr.3 winner Deputy Dancer. A Lookin At Lucky half-sister to the multiple Gr.1 winner Eremein is a highlight of the two-year-old section which also includes youngsters by Hidden Dragon (including a grandson of the Melbourne Cup heroine Jezabeel), Bel Danoro, Freeze, Nothing To Lose and Bagger Vance whilst there are yearlings by Court Command and Walking Or Dancing. There are several nice prospects in the unraced horse section also - including a Onemorenomore gelding out of the stakes winner Get To Work. The tried horse market is very strong at the moment and there is bound to be keen bidding on the likes of city winning High Chaparral gelding Plenty Special, the metropolitan winning Falvelon mare Atlantis Gem, the eight times winning Pins gelding Alfiler, the eight times winning Grandera mare Darcey, the five times winning Pure Theatre gelding Kosciuszko Moon, the consistent La Rive Droite (three times winning, eight times placed daughter of Hidden Dragon) and the two times winners Little Billie Rose and Rochere. And then there are the lightly raced gallopers Respire (a three times winner from just nine starts), Rapido Felino (a two times winner and four times placed from 15 outings), Mr Aces, Outback Wrangler, Our Wishlist, Rapon Nicci, Spinning Crown, Son Of Saga, Atomic Queen, Che Zooms and the easy Toowoomba maiden winner Khe Sanh. And a highlight of this section is the sparingly raced six-year-old On Every Level, an Outback Prince gelding who was beaten only 4.2 lengths in Ethiopia's AJC Derby. www.bloodstockauction.com's Craig Weeding is delighted not only by the growing number of entries for the sale but with the continuing increase in the quality of horses being offered. "The sale is getting bigger and better each time," he said - looking forward to the next auction that takes place from7pm next Tuesday February 17with the live catalogue already up and running. Bloodstockauction are currently running their fourth online auction and there is no time wasting with the sale kicking off with a desirable broodmare, a half-sister to a stakes winner by the great Galileo. Galileo Rosie, whose half-brother King Kool Kat won eight races including the Gr.3 Hyperion Stakes and the Listed Hannan's Handicap, is a member of the always prolific Eight Carat family. The first progeny of high class stayer Illustrious Blue are also sale highlights and the well related Fusaichi Pegasus mare Killer Jewel - in foal to the Goodwood Cup winner - has a colt at foot by him. Also being sold with her foal, an All American filly, Paperback is a King's Best mare from the Corn family that produced Golden Slipper winning successful stallion Catbird. A $220,000 yearling, Push A Shove by Not A Single Doubt is a half-sister to the stakes winning juvenile Raceway whilst Quick Pick is an imported granddaughter of one of the greats of the turf - superstar mare Dahlia. There is another granddaughter of a multiple Group One winner - Rosie's Sunset by proven broodmare sire Woodman having as her second dam the Melbourne Cup heroine Empire Rose. Not surprising Spirit Of Boom proved popular last spring and the sale presents one of the first opportunities to buy a mare in foal to him - Senji Star (who has an Al Samer filly at foot) from the wonderful Rainbeam family of Centaine and Laisserfaire. Fiorente was also popular and in foal to that Melbourne Cup winner is Symphony Strings, a half-sister to the Hong Kong Gr.2 winner Rich Unicorn from the family of Golden Slipper winner Burst. Also from this family is Timeworth, one of several mares being sold in foal to exciting young Redoute's Choice stallion Dr Doute's. Shangeri La by Bernardini - served by Shaft - is out of a half-sister to the leading Irish 2Y0 Basim whilst Fair Cielo is a daughter of stakes winning two-year-old Cloudlet. Stakes winning mares are always popular with sales companies and the Listed winner Victory Grove is ready for an early cover this season. There is further black-type with Visage, a Gr.3 placed dual city winner in foal to Keep The Faith. Amaizing Escape meanwhile has produced black-type, her stakes placed son Signified an eight times winner of over $215,000. Dual Group One winner Ice Point - the first stallion to go through the site's virtual ring - is looking for a new home as are Illustrious Blue, Onemorenomore, Freeze, Moscow Ballet, Clang and Sirius Slew yearlings from proven families. A seven times winner of over $118,000, Tara Man has been in consistent form whilst four times winner Wow Factor looks close to his best after two runs back from a spell. Also bound to prove popular is the lightly raced trial winner Ann's Lucky Boy who was luckless from a wide gate at his only start. Bidding is currently live on bloodstockauction.com and the final countdown commences from 7pm Tuesday the 3rd of February. Blooodstockauction,com has released catalogue number 3 and are offering 44 lots with bidding open for 5 days, and they will all go under the hammer from 7pm Tuesday night. This is another great opportunity for buyers to go online and purchase quality racing and breeding stock. This catalogue offers something for everyone. They have tried horses from NSW, VIC, SA and QLD, many in full work and some are even racing in the next 5 days. There are 2 horses in the trialler section including one that placed at Warwick Farm. Yearlings by I am Invincible, Wanted, Real Saga, Dane Supreme and Stryker and the broodmare quality is high again with sires such as Street Cry, Shamardal Bel Esprit and Snitzel represented. To view the full catalogue of horses on offer head to www.bloodstockauction.com. On the back of a highly successful debut sale Bloodstockauction.com.au's Craig Weeding is excited about sale number two which takes place online on Tuesday January 6 – the catalogue to be launched at 7pm January 1. Entries for the sale closed this week and Weeding is delighted with the quality of horses on offer. "The success of our first sale exceeded all expectations," he said, "and we think the second catalogue is even stronger. "The catalogue will be online for five days prior to the sale and we look forward to buyers logging in across the country." The sale has several highlights including a number of outstanding broodmare prospects – a Casino Prince half-sister to stakes winner Champagne Cath and six times winner Royal Wit in foal to Casino Prince with a filly by hot young stallion Invincible Spirit at foot. Choisir mare Choiricks Magic, granddaughter of the great Horlicks, is another bound to attract plenty of attention – especially as she is in foal to the in-form Written Tycoon with a Danerich colt at foot. Stakes placed five times winner Darlin' Jules (still a racing prospect) is another highlight of the broodmare section and yearlings buyers will also be spoiled for choice with sons and daughters of Magic Albert, Stryker, I Am Invincible, Reaan and Torch Relay on offer. The tried horse section of the first sale was extremely strong and those in the market for in-form gallopers will take a close look at the five times placed In A Perfect World (out of a half-sister to Takeover Target) and the consistent Redoute's Choice gelding Uncle Phil who has been in the placings at three of his last four starts. Canterbury winner Khajan will also be offered for sale as will Doomben winner Stargrill Boy and they will be joined by the untried progeny of such terrific stallions as Flying Spur and Starcraft. "We are aware that this is a particularly busy time of year so we are extremely grateful of the support of vendors," Weeding said. For more information, please contact the team on 1300 849 349. Whilst always confident that Bloodstockauction online sales concept was a winning one, the company's Craig Weeding could not believe just how well the first sale went on Thursday night. With a high clearance rate of 82.5%, the sale attracted bidders from around the country with successful buyers hailing from Victoria, New South Wales, Queensland and South Australia. The gross in excess of $175,000 exceeded Weeding's expectations and he was thrilled just how many different people logged in to bid – over 80 individuals staking a claim. "The support has been phenomenal and we are incredibly grateful," Weeding said, confident that bloodstockauction.comsales are only going to get stronger and more popular. "It is still early days and whilst we have spoken to a lot of people in Queensland, Victoria and New South Wales we still have many people to meet – and we plan to just keep promoting the concept." Topping the sale at $30,500 was the in-form five-year-old Sigmund who was impressive saluting by 2¼ lengths at Ipswich on Wednesday. Sold due to the previous owner's ill-health, the son of Casino Prince attracted no less than 109 bids. The bidding on metropolitan winner More Leverage was also keen, the five-year-old More Than Ready gelding selling for $17,500. Meanwhile the lightly raced and promising maiden Dakabee sold for $17,250. There was also plenty of demand for younger horses with an unnamed Haradasun yearling colt fetching $19,750 whilst off the track horses also found new homes. "We really think as word spreads that both sellers and buyers will embrace the services bloodstockauction.comhas to offer," Weeding said. "And we are looking forward to our next sale on January 6 with entries now open." The response to the first online sale conducted by Bloodstockauction has been so strong that the company's Craig Weeding is counting the hours until the live countdown kicking off at 7pm today. Leading up to the final day, there has been great interest in the selection of broodmares and untried and tried racehorses who have attracted up to 82 bids. "We have been absolutely delighted with the response," Weeding said. "The bidding has been spirited and constant with people logging in from across the country." Weeding is justifiably proud of bloodstockauction.com's first catalogue, noting that two of the race horses – Supercoach and Jebs Boy have not only raced since the bidding opened – but have won! A well related son of Casino Prince, the consistent Supercoach saluted over 2150m at Toowoomba on Saturday whilst Jebs Boy proved three lengths too good for his rivals over 850m at Bundaberg. "It is great to be able to offer fit, in-form horses who can provide an immediate return," Weeding said. Such is the beauty of the bloodstockauction.com concept, horses able to remain in work and racing whilst the sales process is unfolding. Several of the horses are being sold, Weeding noted, due to owners' ill-health, bloodstockauction.com enabling them to move on their horses without any fuss or inconvenience. The live stream of the final hours of the sale takes place at bloodstockauction.com with Mal Johnston and Dane Walker overseeing proceedings. Each lot will close at one minute intervals from 7pm with any bids received in the final 20 seconds to extend that horse's sale time by a further 20 seconds – so be sure to log in to secure your next winner! Exciting times within Bloodstockauction,com today after officially releasing the catalogue for their first ever 100% online Thoroughbred auction in Australia. 27 lots are currently being offered on www.bloodstockauction.com with the final countdown commencing at 7pm on Tuesday the 16th . Owner, breeder and entrepreneur, Anthony Gafa and thoroughbred breaker, Craig Weeding began formulating bloodstockauction.com several years ago, having recognized the need for an alternative platform for marketing racehorses, broodmares and young stock across all levels. Auctions take place on the first and third Tuesday of each month, with bidding open for 5 days prior which allows time for thorough research, viewing and vetting. A strong selection of horses have been catalogued for the December 16 sale, including 15 racehorses, 4 yearlings, 6 broodmares and 2 horses looking for equestrian homes. Due to ill health, one vendor has a number of quality racehorses being offered, mostly unreserved. Many of these horses are in full work and in great form including a number of last start winners. Sires represented in the racehorse section include More Than Ready, Casino Prince and Husson. A highlight of the catalogue is Sigmund who has won his last 2 starts and over $90,000 in prizemoney. Attractive broodmare prospects include mares by Fastnet Rock and Exceed and Excel, a half-sister to Arabian Gold tested positive to Poets Voice, a Flying Spur mare in foal to, Spirit of Boom and a mare with a Statue of Liberty foal at foot. The team has completed a whirlwind trip of Australia promoting the concept and the feedback has been nothing short of remarkable, evidenced by the strong first catalogue including entries from leading farms Widden, Lyndhurst and Emirates. Leading thoroughbred auctions houses are about to be challenged for a dollar share of the lucrative equine industry. Fortnightly online auctions will be launched in December and will add another dimension to buying and selling of racehorses. The site is to hold its first auction on Tuesday December 16 and is to follow with sales on the first and third Tuesday in each month. Craig Weeding said the selling system has several benefits including savings on transport. "There are plenty of savings in travelling the horse and stress it puts on young horses and pregnant horses when the have to be transported to traditional sale ring auctions." he said. He said they have already had strong interest from Australia's leading thoroughbred studs through seminars in Queensland and New South Wales. this Magic Millions thoroughbred sale on the Gold Coast is uncertain. Choose - Compare – Select.